The temporary exhibition hall of the Armenian Genocide Museum-Institute is closed from December 13th to January 20th. On December 17, Hayk Demoyan, the director of AGMI, and the Secretary of State Commission on coordination of the events dedicated to the 100th Anniversary of the Armenian Genocide took part in the International Conference "European Commemoration 2014" in Berlin. There was a special panel dedicated to the Armenian Genocide titled вЂњThe Geographical and Political Dimensions of Memory: the Case of ArmeniaвЂќ. In the official program of the conference it is noted: вЂњ2015 will mark the centenary of the massacres against the Armenian population in the Ottoman Empire, an event that has been polarising memory up till now. These conflicting memories pose difficult questions for European politicians and societies. Therefore, this session aims to pay particular attention to research that focuses on how these events are remembered in EuropeвЂќ. 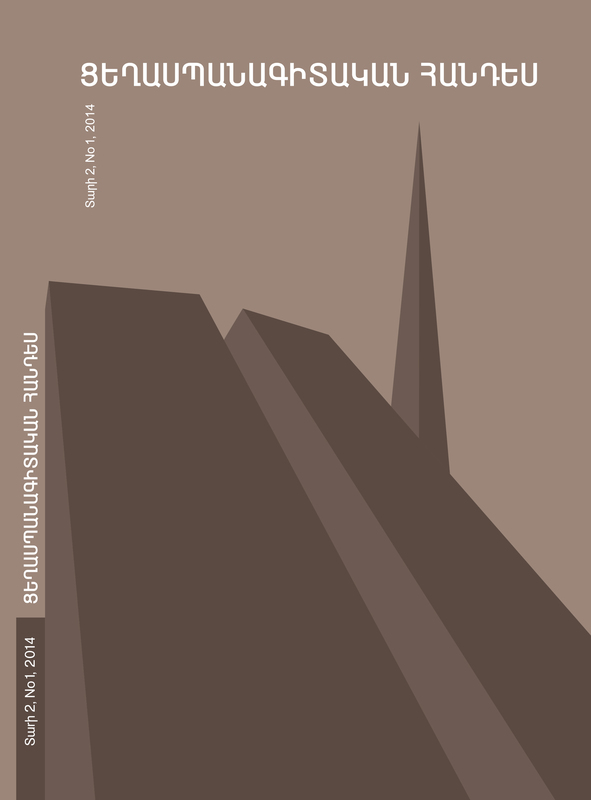 The Armenian Genocide Museum-Institute has published the first issue of academic peer-review journal in English. 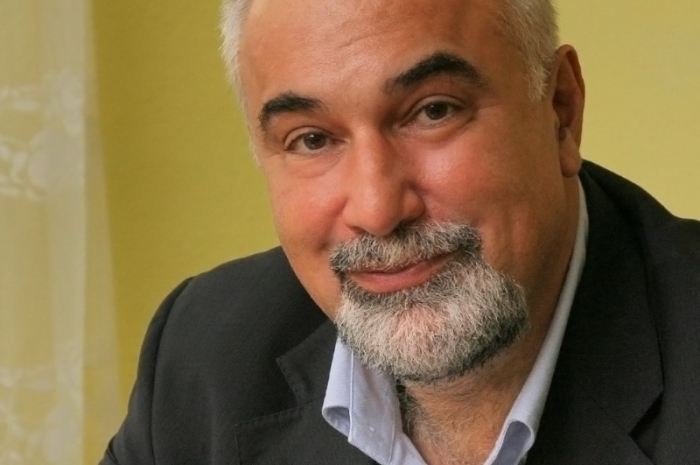 Director of AGMI and the chief editor of the journal Hayk Demoyan says: "At the threshold of the centennial of the Armenian Genocide the publication of this journal can be conceived as a long term initiative enabling the next generation of genocide scholars to develop new insights and research approaches in the study of all genocides and their consequences. IJAGS aims to secure a firm place in the global fight against the crime of the genocide and the scourge and grave danger of denial. IJAGS will fight against denial of any genocide. We envision this endeavor as part of the challenge of establishing early warnings and working towards prevention for the sake of global security". 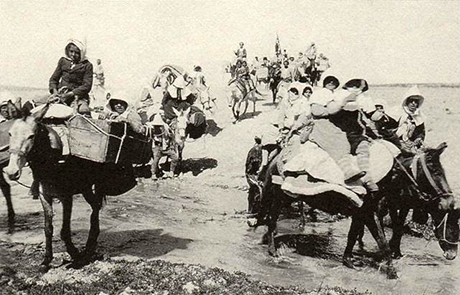 In 1915, news of the large-scale systematic massacres and deportations of Armenians in the Ottoman Empire during WWI sparked a nationwide relief movement in Australia. 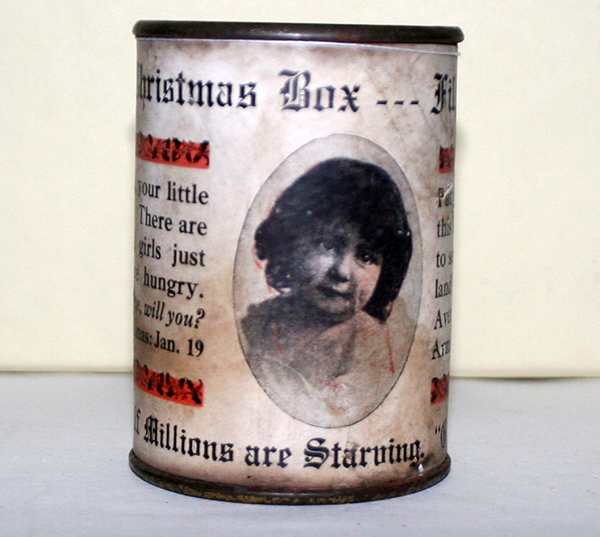 The relief campaign involved a broad spectrum of AustraliaвЂ™s political, civic and religious leaders. The Australian government representatives, public figures and famous performers encouraged Australians to support the relief project. Newspapers and magazines printed special articles informing the public about the relief work and the problem of urgent need. As a result of the nation-wide campaign thousands of Armenians were given the means for self-support. This relief campaign produced a generous response in Australia and culminated in an establishment of Australian-run orphanage in Beirut. 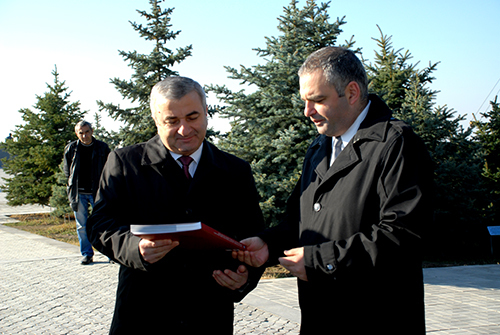 Georgian Minister of Interior Alexander Chikaidze accompanied with RA police Chief Vladimir Gasparyan visited Tsitsernakaberd Memorial Complex. Alexander Chikaidze and Vladimir Gasparyan laid a wreath at the Memorial, then the members of the Georgian delegation put flowers at the eternal fire and honored the memory of the innocent victims with a minute of silence. 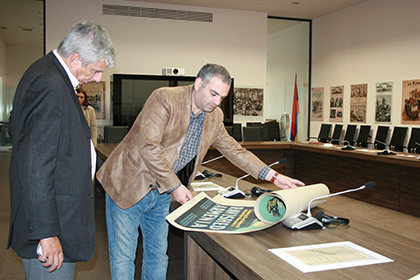 Hayk Demoyan, Director of AGMI, accompanied the guests and presented the story of the Memorial Complex. The guests visited the memorial alley, where the Minister Alexander Chikaidze watered the fir planted by the Georgian President. You are from Argentina, where everything is differentвЂ¦ world outlook, challenges. So, what do you feel touching upon the themes of the Armenian history and Armenian Genocide? My stay in Armenia has given me the opportunity to learn about the countryвЂ™s history and to experience its culture. Of course, each genocide has its own unique characteristics: the reasons that led to it, the methods and technologies used for annihilation вЂ”the technology of powerвЂ”, the subsequent attempts at rationalizing it, and the struggle for punishment and for finding out the truth about what happened. In order to understand mass violence, massacres and genocides, as well as to prevent their organization and implementation it is necessary to conduct a research of convictions of different social groups, the concerns they have, their goals and motives for participation in mass violence. Recent studies show that the human resource implementing mass murder and genocide is in fact replenished by such marginalized groups as women and children, who were not less as cruel as the adults. 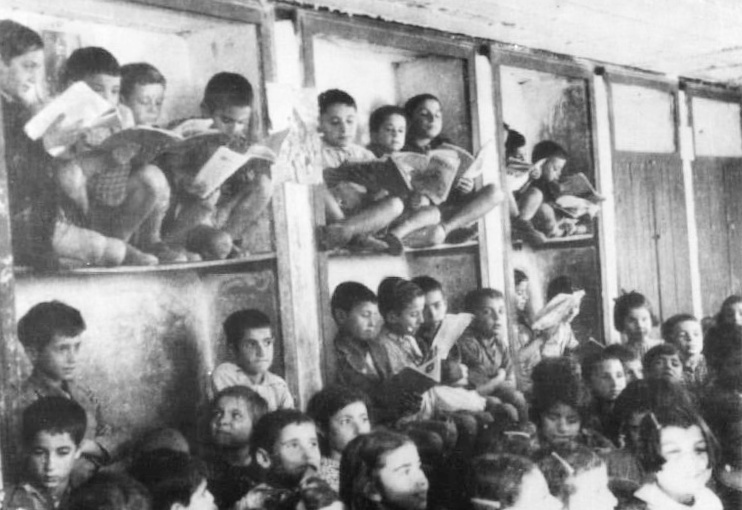 In this article examples of the functional peculiarities of participation of Muslim children in the mass murders and genocide committed against the Armenians in the Ottoman Empire at the end of the 19th and beginning of the 20th century are presented. Children have often appeared to be immediate participants; teens pursued their elders (intergroup conflicts between Armenian and Muslim children), children violated corpses while imitating adults. 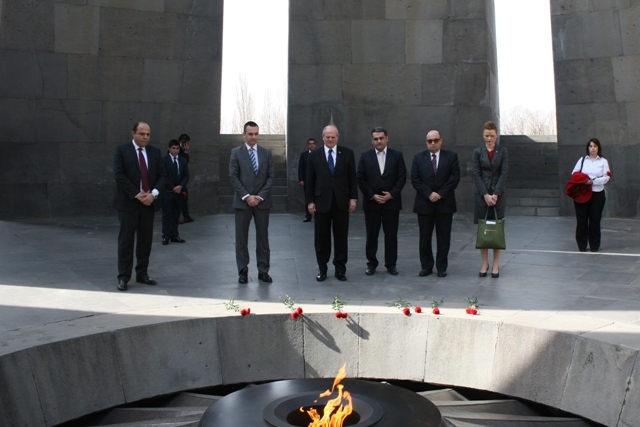 The delegation headed by the President of the House of Representatives of the Republic of Cyprus Yiannakis Omirou accompanied by RA NA Vice President Eduard Sharmazanov visited the Armenian Genocide Memorial Comples. Yiannakis Omirou laid a wreath at the Memorial of the Armenian Genocide victims, and then Cyprus guests laid flowers at the eternal fire and honored the memory of the innocent victims with a minute of silence. The exhibition вЂњArmenian Genocide: Front Page Coverage in the World Press" and the presentation of same titled book was organized by the Armenian Genocide 100th anniversary committee of the Armenian Diocese of Tehran. The guest-speaker of the event was doctor of historical sciences Hayk Demoyan; the author of the book, director of AGMI, and the Secretary of State Commission on coordination of the events dedicated to the 100th Anniversary of the Armenian Genocide. 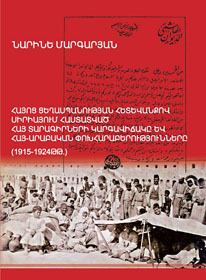 The exhibition that opened on 14 November in вЂњAraratвЂќ cultural complex and organized by the initiative of Armenian Genocide 100th anniversary committee of the Armenian Diocese of Tehran, included 60 images that reflect the real picture of the Turkish crime against humanity and civilization, which has always been in the focus of world press. The chief development officer of вЂњCISCO SYSTEMSвЂќ, 2014 laureate of the global IT Award of the President of Armenian Mario Mazzola visited Tsitsernakaberd Memorial Complex of theArmenian Genocide. Mario Mazzola and the accompanying delegation put flowers at the eternal fire and honored the memory of the innocent victims with a minute of silence. Mr. Mazzola also visited the Memorial Alley of the Memorial Complex, where he planted a fir. Under the presidency of His Holiness Garegin II, Supreme Patriarch and Catholicos of All Armenians and His Holiness Aram I, Catholicos of the Great House of Cilicia, leaders of Armenian Dioceses visited Tsitsernakaberd Memorial Complex of Armenian Genocide. Both Catholicoses laid a wreath at the Memorial of the Armenian Genocide victims. 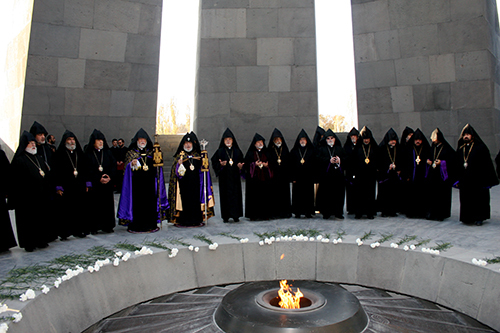 Bishops of Armenian Dioceses of different countries put flowers at the eternal fire and held a memorial service for the peace of souls of the Armenian Genocide victims. The Bishops Synod of the Armenian Apostolic Church will launch on 11 November at the Mother See of Holy Echmiadzin. The discussion will focus on the issue of the Canonization of the Armenian Genocide victims. The school principles of Yerevan were hosted at the conference hall of the Armenian Genocide Museum-Institute to get acquainted with the academic and especially educational programs and the initiatives of the museum-institute on the eve of the Centennial of the Armenian Genocide, in part of which all the schools in Yerevan will be direct participants. 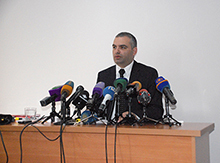 Director of the Armenian Genocide Museum-Institute Hayk Demoyan informed the guests, that currently the renovation and modernization works are being carried and underlined that one of the renewed hall will serve as an educational hall since May 2015, where the pupils will study the Armenian Genocide with special educational methods. Several books, falsifying history and denying the role of the Turks in the Armenian Genocide were published long before the birth of Turkish republican historiography. 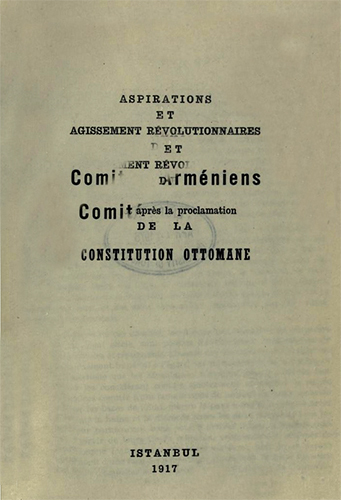 First and the most important was the book titled вЂњThe Actions and Revolutionary Movements of the Armenian CommitteesвЂќ published in Constantinople in 1916. With the help of this publication, the Committee of Union and Progress wanted not only to avoid the responsibility for the Armenian Genocide, but also to blame the Armenians for everything. In this book, all key elements of the Turkish denial of the Armenian Genocide have been presented in written form for the first time. Later Turkish official republican historiography not only repeated, but developed the main arguments of this book. 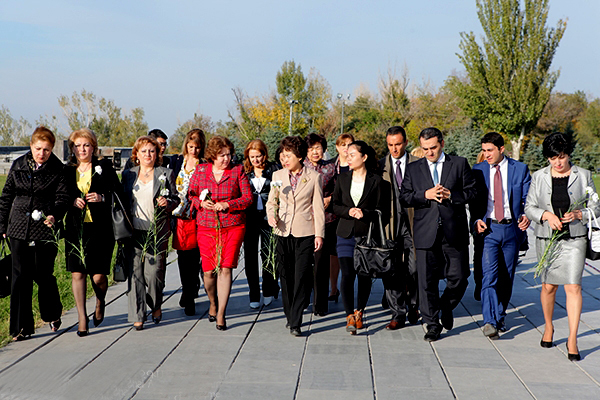 Delegation of RA and NK National Assembly Cooperation Committee visited Armenian Genocide Memorial. RA NA Vice President Hermine Naghdalyan and NK National Assembly President Ashot Ghulyan and high ranking officials were among the delegates. The guests were accompanied by Hayk Demoyan, Director of Armenian Genocide Museum-Institute. 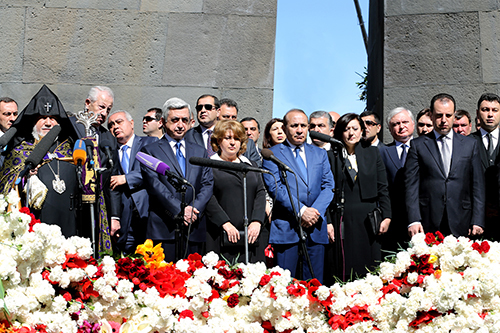 NK National Assembly President Ashot Ghulyan laid a wreath at the Memorial of the Armenian Genocide victims, and then the members of the delegation put flowers at the eternal fire and honored the memory of the innocent victims with a minute of silence. 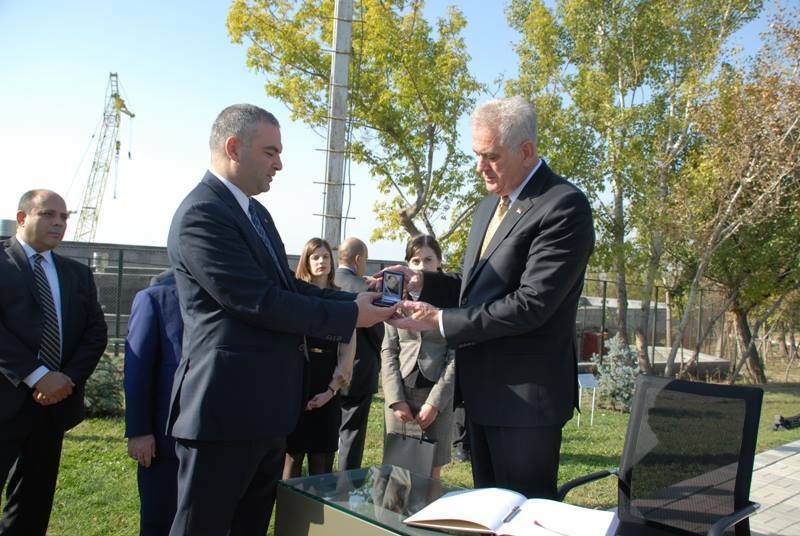 On 3 November 2014, UK minister of State for Europe David Lidington accompanied with Hayk Demoyan, Director of Armenian Genocide Museum-Institute, visited the Armenian Genocide Memorial Complex. David Lidington laid a wreath at the Memorial, and honored the memory of the innocent victims with a minute of silence at the eternal fire. Member of Federation Council of Russia, Co-Chairman of the Armenian-Russian Inter-Parliamentary Committee Nikolay Ryzhkov visited Tsitsernakaberd Memorial Complex of the Armenian Genocide. Nikolay Ryzhkov was accompanied with Hermine Naghdalyan, RA NA Vice President, Ivan Volinkin, Ambassador Extraordinary and Plenipotentiary of the Russian Federation to RA, Hayk Demoyan, Director of AGMI. Nikolay Ryzhkov and Hermine Naghdalyan laid a wreath at the Memorial of the Armenian Genocide victims, then members of the Russian delegation laid flowers at the eternal fire and honored the memory of the innocent victims with a minute of silence. 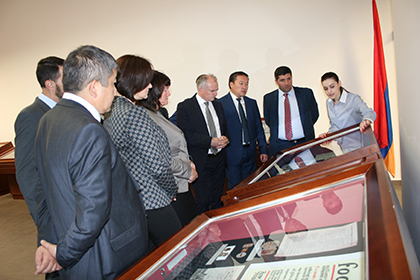 On 23 October, Turkish journalists visited the Armenian Genocide Museum-Institute (AGMI). They were in Armenia within the framework of the project вЂњMedia Bus TourвЂќ organized by Eurasia Partnership Foundation. The journalists visited the temporary exhibition hall of the museum and got acquainted with the temporary exhibition dedicated to the WWI centennial. After that, they had a meeting and active discussion with Hayk Demoyan, the Director of Armenian Genocide Museum-Institute and the Secretary of State Commission on coordination of the events dedicated to the 100th Anniversary of the Armenian Genocide. 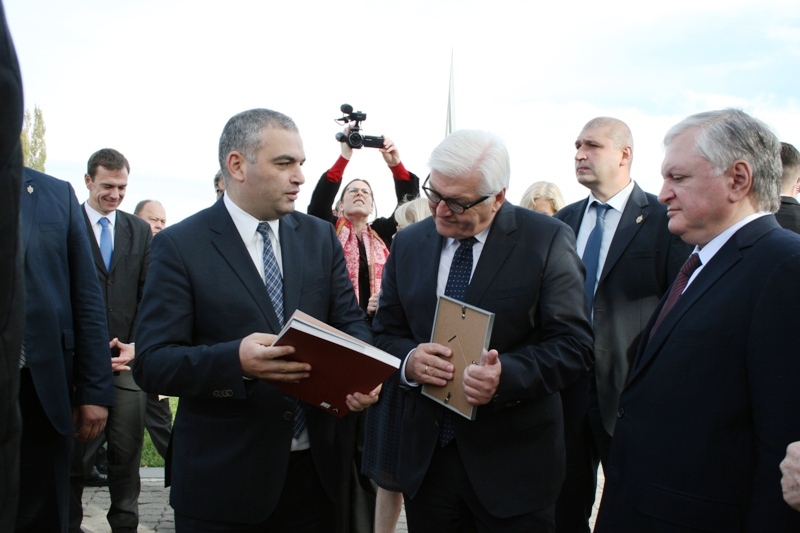 On October 23, within the framework of his official visit to Yerevan, German Foreign Minister Frank-Walter Steinmeier togather with RA Foreign Minister Edward Nalbandyan visited Tsitsernakaberd Memorial Complex. The high-ranking officials were accompanied with the Director of AGMI HaykDemoyan. The Minister Frank-Walter Steinmeier laid a wreath at the Memorial of the Armenian Genocide victims, then the German guests put flowers at the eternal fire and honored the memory of the innocent victims with a minute of silence. On 23 October the delegation of the All-China WomenвЂ™s Federation visited Tsitsernakaberd Memorial Complex. They were accompanied by Hermine Naghdalyan, RA NA vice president, Member of Parliament Ruzan Muradyan as well as the deputy director of AGMI Suren Manukyan. The guests laid flowers at the eternal fire and honored the memory of the innocent victims with a minute of silence. The delegation also visited AGMI and got acquainted with the temporary exhibition of the museum, which represents the story of the Armenian Genocide. 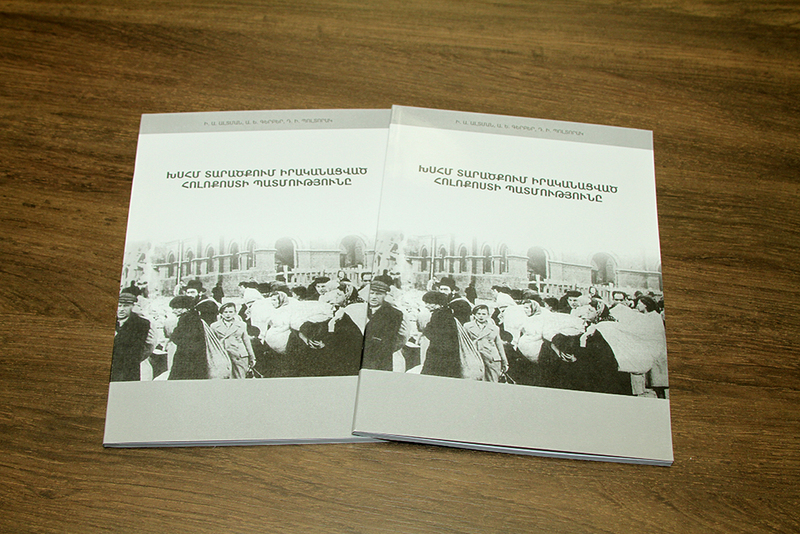 The Armenian Genocide MuseumвЂ“Institute has published the second volume of scientific periodical вЂњJournal of Genocide StudiesвЂќ. This volume includes topics and articles related to the history, sociology, psychology and linguistics of genocide, as well as international criminal law. In the editorial of the volume Hayk Demoyan, Director of Armenian Genocide Museum-Institute and Secretary of State Commission on coordination of the events dedicated to the 100th Anniversary of the Armenian Genocide, presents the conceptual approaches of organizing events dedicated to the centennial. 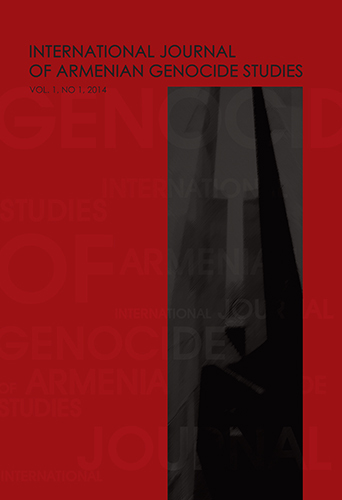 As it has already been noted, the Armenian Genocide MuseumвЂ“Institute has started to publish вЂњJournal of Genocide StudiesвЂќ. 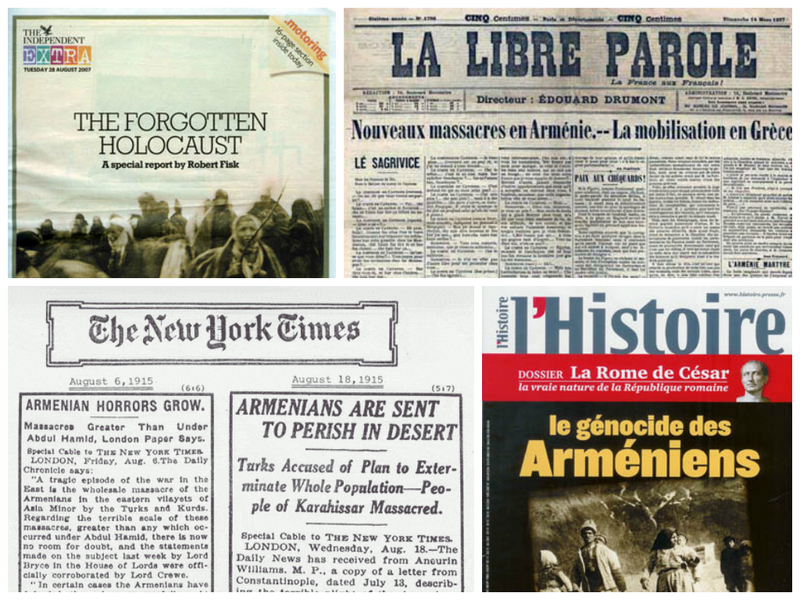 The journal will include topics and articles related to the history of the Armenian genocide, as well as full and comprehensive research on the problems and the aspects related to the topic. 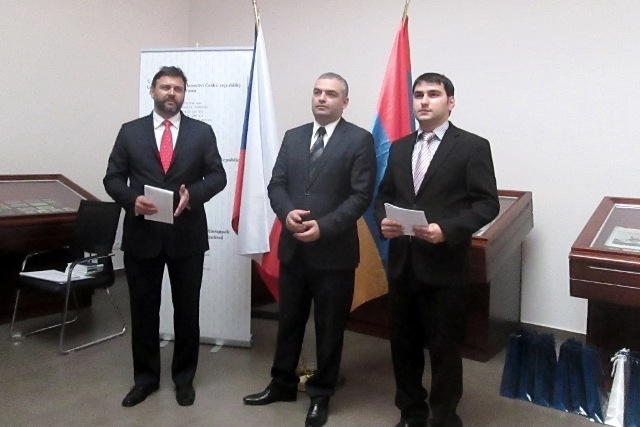 The presentation of the Armenian translation of Study Manual about Holocaust in the former territory of the USSR took place October, 18, 2014 at the Armenian Genocide Museum-Institute. It was published firstly by Russian Holocaust Center. 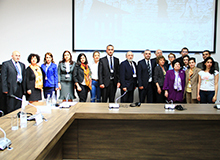 The presentation was followed by a scientific-practical seminar titled вЂњThe issues of teaching the Armenian Genocide and Holocaust in schoolsвЂќ. At the seminar their lectures held two authors of the handbook вЂ“ Ilya Altman (Co-chairman of Russain Holocaust Center) and Alla Gerber (the President of Russian Holocaust Foundation, member of the first convocation of Russian State Duma), Hayk Demoyan (Director of Armenian Genocide Museum-Institute), Suren Manukyan (Deputy Director of Armenian Genocide Museum-Institute), Harutyun Marutyan (Leading Specialist of Institute of Archeology and Ethnography), Russian teachers Tatiana Pasman (Methodist in the sphere of qualification improvement of education sector employees at Pskov University), Natalia Anisisna (senior fund keeper of Jewish Heritage and Holocaust Museum, Moscow) and Olga Gorskih (Methodist in the sphere of qualification improvement of education sector employees at Tomsk University) as well as Armenian teachers and specialists in the field hold their papers. Today at the conference hall of AGMI, the presentation of the book "Armenian Genocide: Front Page Coverage in the World Press" took place. The author of the book Hayk Demoyan is the director of AGMI, doctor of historical sciences and the Secretary of State Commission on coordination of the events dedicated to the 100th Anniversary of the Armenian Genocide. 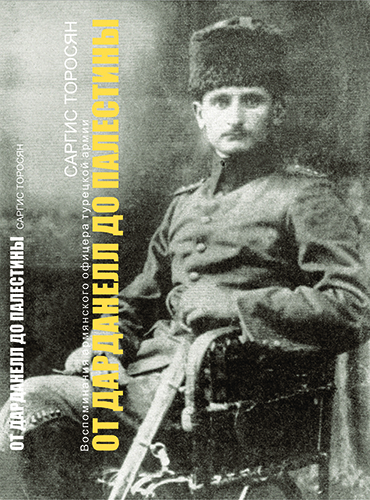 The book is in two languages: Armenian and English. It was published due to sponsorship of вЂњAmeriaвЂќ Group. During the presentation a welcome speech was made by Vigen Sargsyan, the head of RA president staff and the coordinator of the State Commission on coordination of the events dedicated to the 100th Anniversary of the Armenian Genocide. Within the framework of вЂњBelarus Culture Days in ArmeniaвЂќ Belarus Minister of Culture Boris Svedlov visited Tsitsernakaberd Memorial Complex. 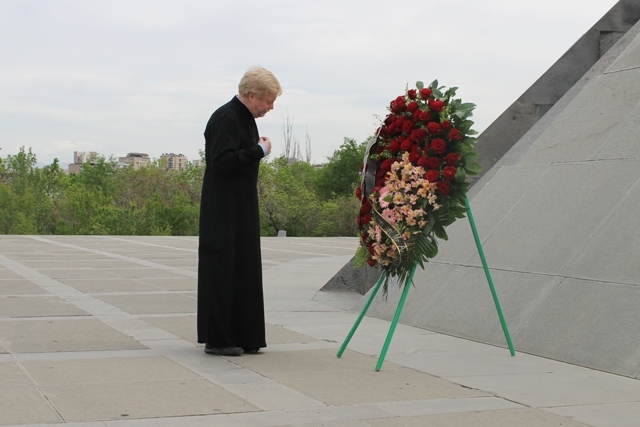 The members of the Belarusian delegation laid flowers at the eternal fire by honoring the memory of the innocent victims with a moment of silence. 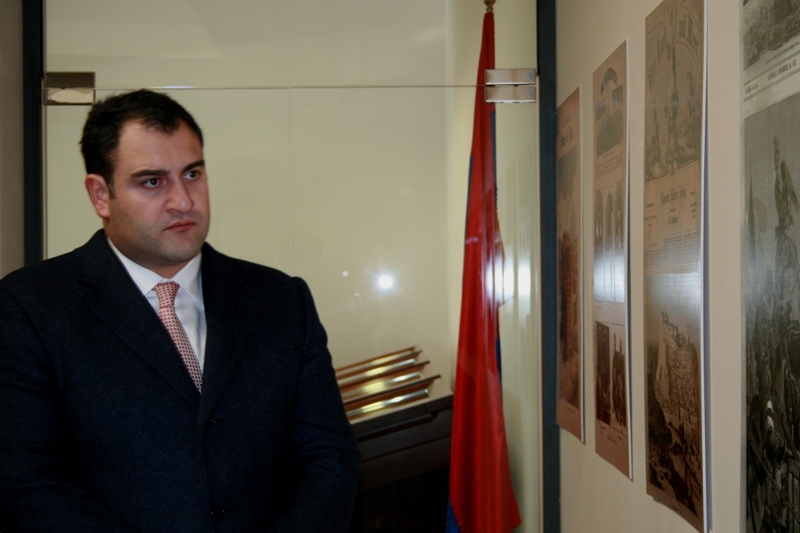 Belarus Minister of Culture Boris Svedlov and the accompanying delegation had also visited AGMI and got acquainted with the temporary exhibition of the museum, which represents the history of the Armenian Genocide. 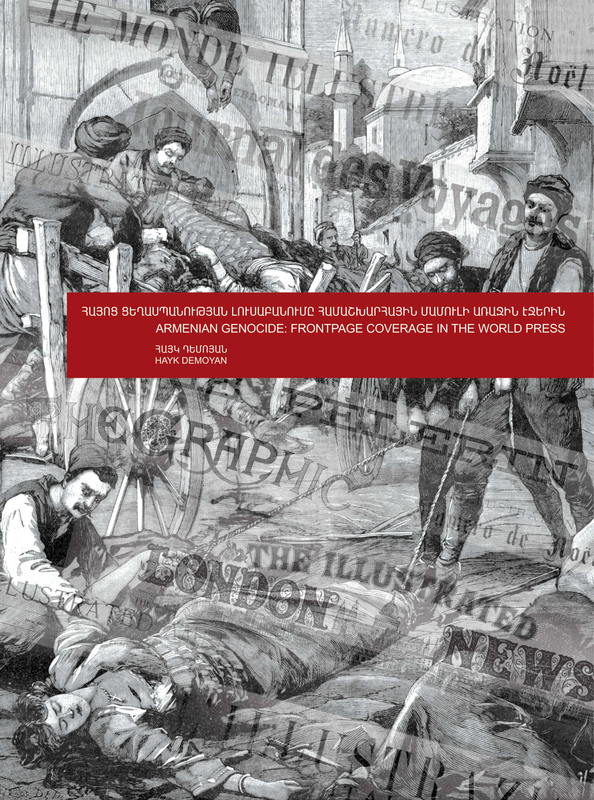 The presentation of Hayk DemoyanвЂ™s latest book titled вЂњArmenian Genocide: Front page coverage in the world pressвЂ™вЂ™ will be held in the conference hall of the Armenian Genocide Museum-Institute (AGMI) on October 17, 2014 at 12.00 pm. 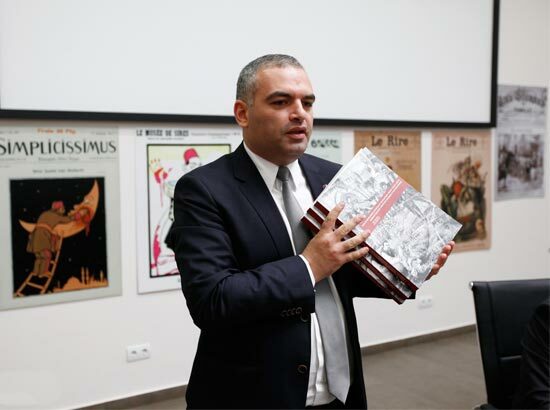 The author of the book Hayk Demoyan is the director of AGMI, doctor of historical sciences and the Secretary of State Commission on coordination of the events dedicated to the 100th Anniversary of the Armenian Genocide. The book is in two languages: Armenian and English. It was published due to sponsorship of вЂњAmericaвЂќ Group. The presentation will be welcomed by Vigen Sargsyan, the head of RA president staff and the coordinator of the State Commission on coordination of the events dedicated to the 100th Anniversary of the Armenian Genocide; Tigran Jrbashyan, the development director at вЂњAmericaвЂќ Group; Harutyun Marutyan, the doctor of historical sciences and the leading scientific worker of RA National Academy of Sciences, Institute of Archeology and Ethnography. 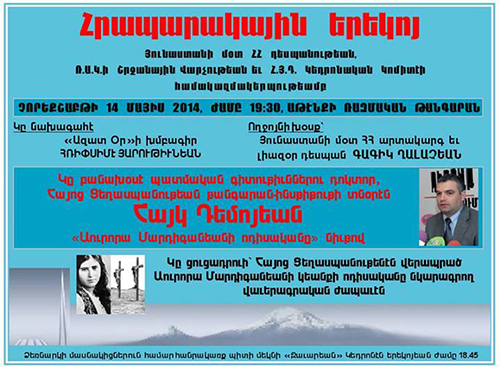 Hayk Demoyan, the author of the book, will welcome with his speech as well. Within the State visit to Armenia in October 10-12, President of the Serb Republic visited Tsitsernakaberd Memorial Complex. He was accompanied by RA Foreign Minister Edward Nalbandyan and the Director of AGMI Hayk Demoyan. President Timoslav Nikolic laid a wreath at the Memorial of the Armenian Genocide victims, then members of the Serbian delegation laid flowers at the eternal fire by honoring the memory of the innocent victims with a moment of silence. The Serbian president also visited the Memorial Alley and planted a fir there. 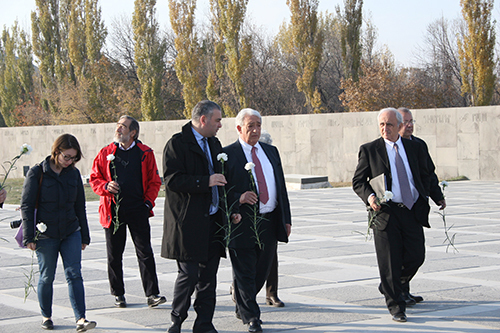 вЂњErebuni-Yerevan 2796вЂќ celebration guests visited Tsitsernakaberd Memorial Complex. 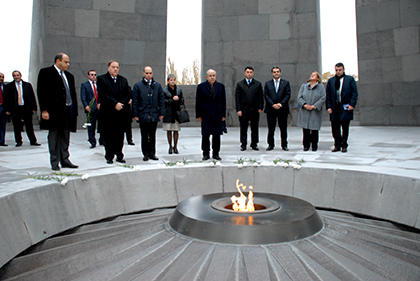 Mayors from different countries worldwide laid a wreath at the Memorial of the Armenian Genocide victims. 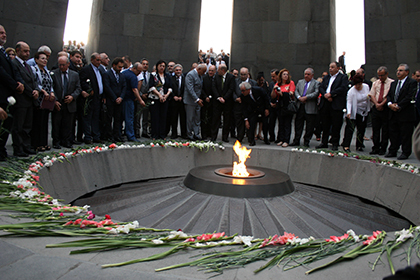 Members of delegation of вЂњErebuni-Yerevan 2796вЂќ celebration also laid flowers at the eternal fire and honored the memory of the innocent victims with a moment of silence. 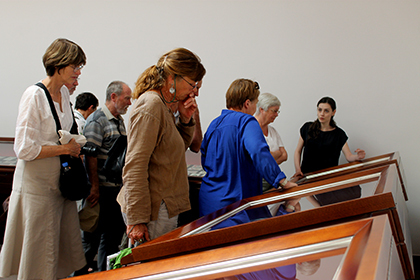 The guests also visited AGMI and got acquainted with the temporary exhibition of the museum, which represents the history of the Armenian Genocide. His Holiness Garegin II, Supreme Patriarch and Catholicos of All Armenians and His Holiness Mor Ignatius Aphrem II, Syriac Orthodox Patriarch of Antioch & All the East visited Tsitsernakaberd Memorial Complex and honored the memory of the innocent victims of the Armenian Genocide. They were accompanied by the members of the Brotherhood of the Mother See of Holy Etchmiadzin and Syriac Orthodox Church Delegation. With the leadership of Catholicos of All Armenians and Patriarch of Antioch & All the East a requiem service was held near the eternal fire for the peace of souls of thousands Armenian and Assyrian martyrs. 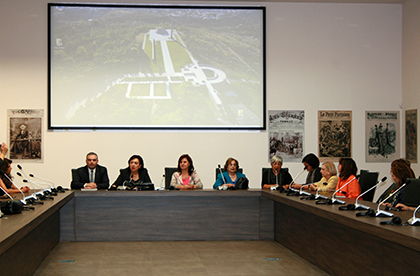 The participants of 7th conference of the International Association of Armenian Women accompanied by RA Minister of Diaspora, Chairman of the Armenian branch of Armenian International Women's Association Hranush Hakobyan and Director of Armenian Genocide Museum-Institute visited Tsitsernakaberd Memorial Complex. Members of the delegation laid flowers at the eternal fire and honored the memory of the innocent victims with a minute of silence. 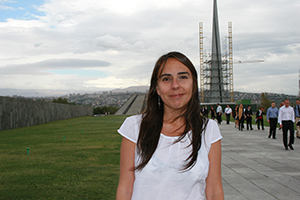 On 9th October Eleni Theocharous, a Deputy of the European Parliament, the leader of the European Union-Armenia Friendship Group, visited Tsitsernakaberd Memorial Complex. Mrs. Theocharous and the accompanying delegation laid flowers at the eternal fire and honored the memory of the innocent victims with a moment of silence. Deputy of the European Parliament also visited the Memorial Alley and watered the fir which she had planted during one of her previous visits. 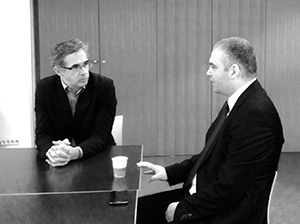 Today the Armenian Genocide Museum-Institute hosted Mr. Jean-Yves Camus,a representative of Paris MayorвЂ™s Office. He has arrived in Yerevan to get acquainted with the exhibits being presented in Paris municipal exhibition halls. 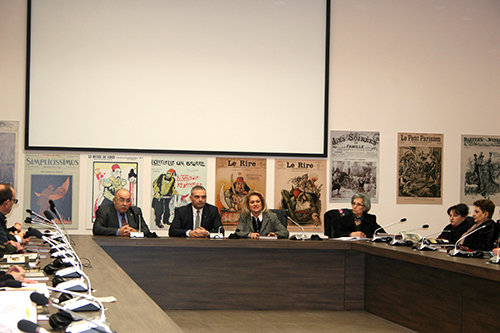 The exhibition within the centennial events of the Armenian Genocide is being organized by the Paris City Hall and the Armenian Genocide Museum-Institute collaboration. Paris MayorвЂ™s Office representative Mr. Jean-Yves Camus and the Director of Armenian Genocide Museum-Institute Hayk Demoyan talked of the matters about the exhibitionвЂ™s organization. Jean-Yves Camus noted that вЂњThe Former Mayor of Paris Bertrand Delanoe and his legal successor Anna Hidalgo made a decision to host an exhibition dedicated to the history and memory of the Armenian Genocide. The exhibition will be opened in April 2015 and will include exhibits and documents provided by the Armenian Genocide Museum-Institute. Hence, a strong collaboration is carried out with the museum-instituteвЂќ. Today, an event was hold at the Armenian Genocide Museum-Institute dedicated to the 135th Anniversary of Inga Nalbandyan, a Danish writer and armenophile. Inga NalbandyanвЂ™s grandson Frans Nalbandyan was also present there. AGMI Director Hayk Demoyan welcomed the guests and on behalf of the Armenian people expressed his gratitude to Inga Nalbandyan for her unique work. 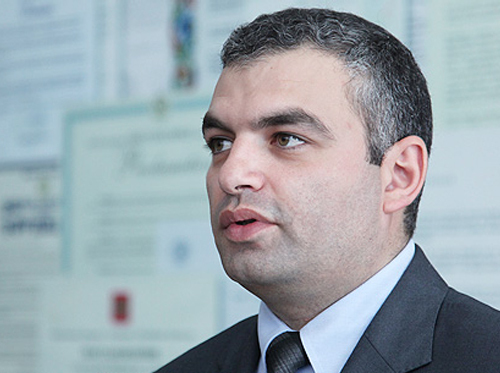 Frans Nalbandyan, made a speech and submitted minute details of his grandmothersвЂ™ life. On September 29-8-29, 2014, by the invitation of вЂњTkumaвЂќ Ukrainian Institute of Holocaust studies, researcher of AGMI Robert Tatoyan has participated in Ukrainian city of Dnepropetrovsk, in the commemoration ceremony dedicated to the 73th anniversary of Babi Yar tragedy, as well as a number of events organized in the framework of this ceremony, including the opening of German touring exhibition вЂњDictatorship and Democracy in the Age of ExtremesвЂќ and summing up of creative competition вЂњLessons of War and HolocaustвЂќ. 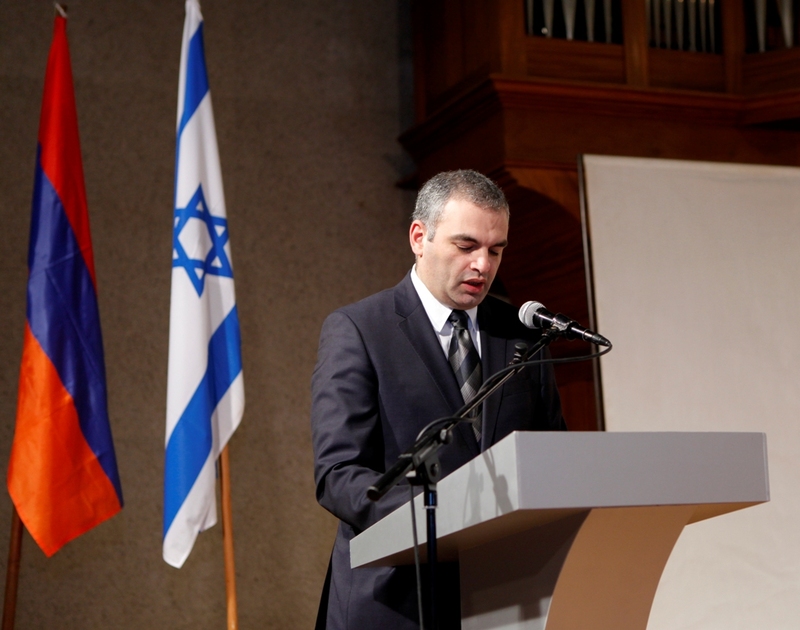 In his speech during the commemoration ceremony Robert Tatoyan referred to the parallels between the Jewish Holocaust and Armenian Genocide, and noted the importance of becoming the memories of Armenians and Jews who survived the genocide, part of the memory of mankind in general, something which will allow us to create a more stable base for the prevention of future crime. Samantha Lakin: "I feel itвЂ™s a historic moment for many reasons..."
- Hi, dear Samantha, congratulations, you have become the second alumni of the Lemkin scholarship in this year. What are your impressions? My impressions of Armenia and the AGMI have been very good. Armenia has been an interesting place to live for the past few weeks. It seems like Armenia has not experienced full Western or European integration yet, and so many people do not speak English and are still excited to see Americans visiting their country. All of the colleagues, interviewees, and fellow researchers I have met have been nice, helpful, and intelligent. 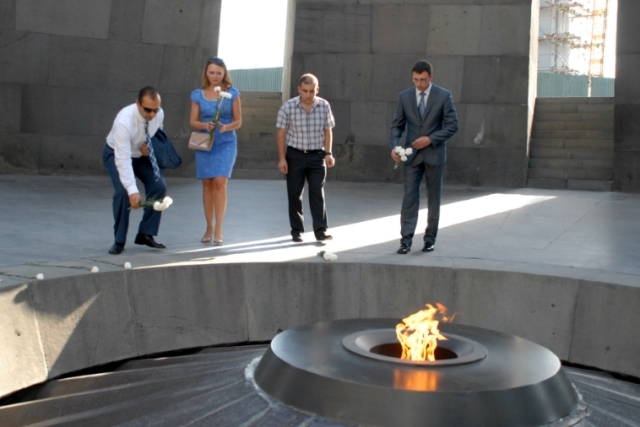 The US Peace Corps volunteers in Armenia visited Tsitsernakaberd Memorial Complex, put flowers at the Eternal Fire and honored the memory of the innocent victims with a minute of silence. The US Peace Corps volunteers also visited AGMI and got acquainted with the temporary exhibition of the museum, which represents the story of the Armenian Genocide. Deputy Director of AGMI Lousine Abrahamyan delivered a lecture about Arshalouys (Aurora) Mardiganian, a girl from Chmshkatsag, who survived the Genocide, and the odyssey of her life to the Peace Corps Volunteers. 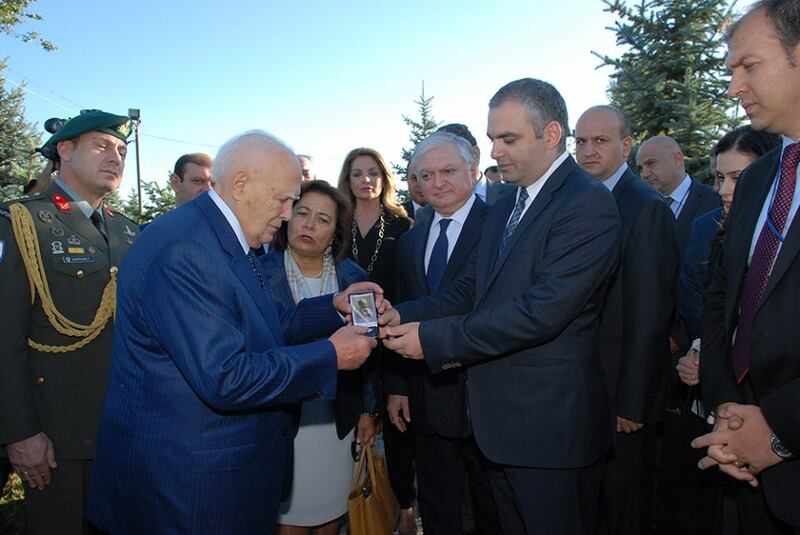 Within the framework of his state visit to Armenian in 29 September- 1 October, Greek president Karolos Papoulias accompanied with Armenian Foreign Minister Edward Nalbandyan and Mayor of Yerevan Taron Margaryan visited Tsitsernakaberd Memorial Complex. The Greek president laid a wreath at the Memorial of the Armenian Genocide victims, than members of Greek delegation laid flowers at the eternal fire and honored the memory of the innocent victims with a minute of silence. 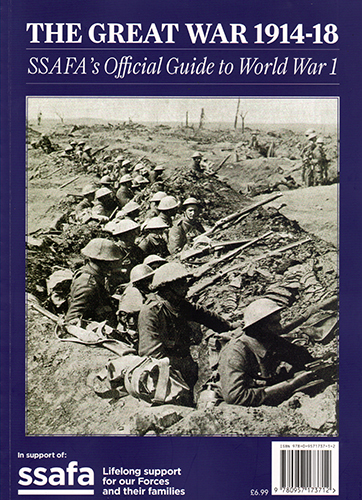 The President of the Republic of Armenia, Serzh SargsyanвЂ™s letter of commemoration was published in the Soldiers', Sailors' and Airmen's Families Association's (SSAFA) special issue вЂњThe official Commemorative guide to the 100th Anniversary of the Great War: 1914-1918вЂќ. The President Serzh Sargsyan particularly said: вЂњFirst World War is one of the most horrendous pages of the human history and an inexhaustible and responsible topic of thorough analysis and interpretations. The First World War left lasting impact on the lives of numerous nations and states that caused millions of casualties, distorted fates and sufferings, destructions abs brutalities. 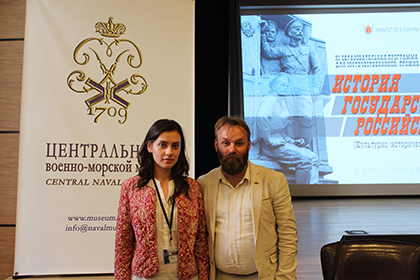 Deputy director of museum affairs of AGMI LousineAbrahamyan has participated in the courses вЂњHistory of the Russian StateвЂќ organized by the Committee of External Relations of St. Petersburg from 31 August to 11September. 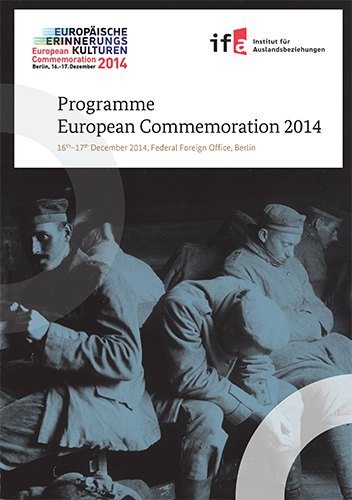 This year the course was dedicated to the WWI centennial. 54 participants from 21 countries had the opportunity to attend the lectures ofthe leading experts of St. Petersburg universitiesabout the preparedness of the Russian troops in WWI, Russian special purpose detachments,East Prussian Operation, Russian naval forces and other topics. 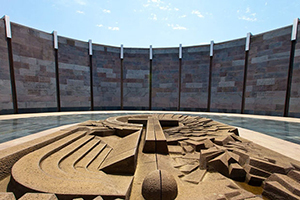 Within the framework of the 21st meeting of Commonwealth of Independent States Tax ServicesвЂ™ leaders, which was held on September 25 in Yerevan, the representatives of CIS countries visited Tsitsernakaberd Memorial complex. The visitors put flowers at the eternal fire and honored the memory of the innocent victims with a minute of silence. 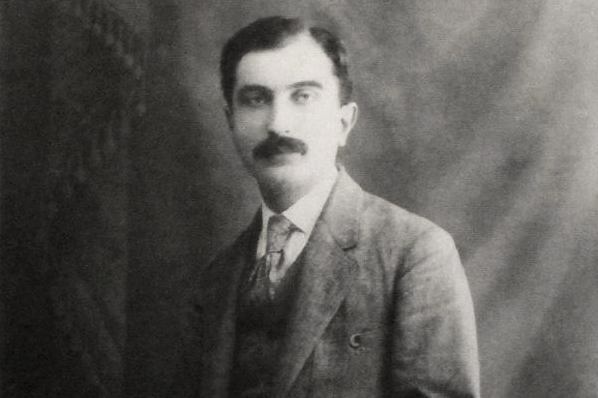 Story of a prominent architect in the Washington, D.C. Mihran Mesrobian is reminding a biography of Sarkis Torossian and other Armenians, who were drafted into the Ottoman Army during the WWI and whose families, at the same time, became victims of the Armenian Genocide. Mihran Mesrobian's granddaughter Caroline Mesrobian-Hickman, a best known researcher of his grandfather's art, shared her memories about him. The Armenian Genocide Museum-Institute announces 2015 LEMKIN SCHOLARSHIP program for foreign students and PhD candidates. 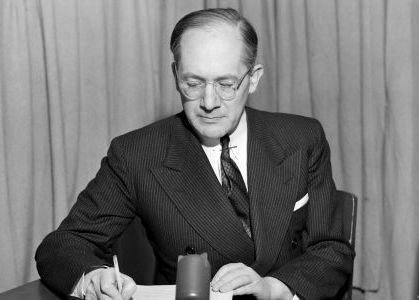 Raphael Lemkin scholarship is intended to enable foreign students, who specialize in genocide studies, especially in the Armenian Genocide, to visit Armenia for a month to conduct research in local scientific institutions and libraries. The Participants of the 5th Armenia-Diaspora PanArmenian Conference to be held in Yerevan on September 18-20 visited Tsitsernakaberd Memorial Complex. The members of the delegation among whom different organization leaders and representatives from 60 Diaspora countries as well as journalists put flowers at the eternal fire and honored the memory of the innocent victims with a minute of silence after which clergymen performed a memorial service for the soul of innocent victims. Within the last five years numerous talks could be heard about the Turks who rescued the Armenians during the years of genocide. The expression вЂњthe Turks who rescued the ArmeniansвЂќ sounds a bit strange, if not wrathful to an Armenian hearing. But is it true? An affirmative answer is recorded вЂ“ yes, it is true. 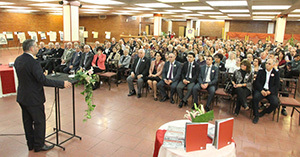 There are myriad examples and stories from handwritten and published memoires of the genocide survivors, as well as from oral stories stating about the mercifulness of ordinary Muslims вЂ“ Turks, Kurds, Arabs and others, who helped Armenian individuals and whole families to survive, even if temporarily. Yet, at least two challenges should be considered, referring to this topic. The first one is the classification of such cases. In general, human behavior reacts differently to wars, mass atrocities and natural disasters. Speaking about the Armenian genocide, the first and the most important statement is that the crime constituted a state organized and orchestrated genocide. 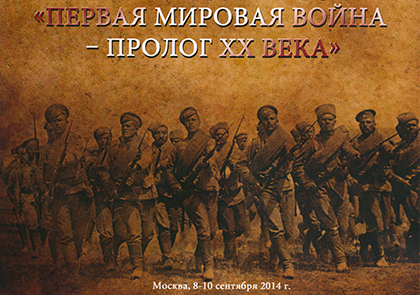 On September 8-10, 2014 international conference вЂњThe First World War as a Preface to the 20th CenturyвЂќ took place in Moscow, which was organized by the Institute of General History of the Russian Academy of Sciences, Moscow State University and Academic University of Humanities (MCPU). During the conference more than 100 historians from 25 countries, Russia, Austria, France, Italy, Canada, USA, Eastern Europe and the CIS countries presented their reports. 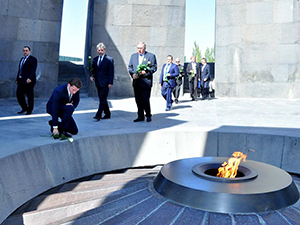 On September 8 within the framework of his state visit to Armenia Austrian Foreign Minister Sebastian Kurz visited Tsitsernakaberd Memorial Complex and paid tribute to the victims of the Armenian Genocide. 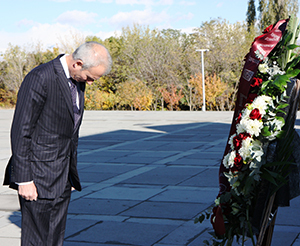 Austrian Foreign Minister laid a wreath at the Memorial of the Armenian Genocide victims. Then members of the delegation laid flowers at the eternal fire and honored the memory of the innocent victims with a minute of silence. 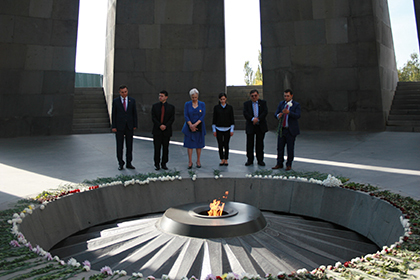 On the occasion of the commemoration of the 100th anniversary of French public and political figure, socialist and Armenophil Jean JaurГЁs, delegation of the Socialist party of French National Assembly visited the Memorial Complex of the Armenian Genocide. The French delegation headed by the chairman of the Socialist party of French National Assembly Bruno Le Rui accompanied by the director of AGMI Hayk Demoyan laid a wreath at the Memorial of the Armenian Genocide victims. Then members of the delegation laid flowers at the eternal fire and honored the memory of the innocent victims with a minute of silence. 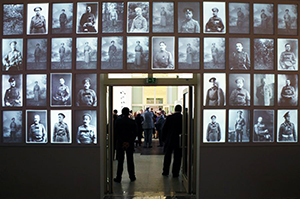 The Armenian Genocide Museum-Institute participated in the exhibition вЂњLook at the Eyes of the WarвЂќ at the State Exhibition Hall of Moscow, which is dedicated to World War I. Dozens of museums and archives from Russia, USA, Germany, Netherlands, Serbia, Ukraine as well as Armenia on behalf of the Armenian Genocide Museum-Institute participated in the organization of the exhibition. The delegation of Parliament Members of Canadian Confederation visited Tsitsernakaberd Memorial complex of the Armenian Genocide. Members of the Canadian Parliament put flowers at the Eternal Fire and honored the memory of the innocent victims with a minute of silence. In late June the radical Islamic organization of ISIS (The Islamic State of Iraq and al-Sham) by some information backed by Turkey declared the establishment of the Islamic Caliphate in Iraq and in a part of Syria. This quazi-state declared the laws of Sharia on the territory under its control. Christians and Yezidis on the territory of ISIS control are also subjected to harsh pressures. The fled of tens of thousands of Christians and Yezidis from the area occupied by ISIS is accompanied by the daily-increasing danger. The Islamists regard Yezidis as Pagans which is a crime worthy of death in Islam. 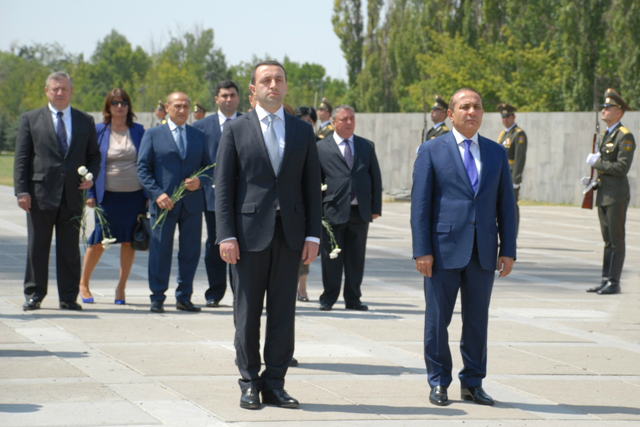 Prime Minister of Georgia Irakli Garibashvili and the accompanying delegation visited Tsitsernakaberd Memorial Complex within the framework of his state visit to Armenia on August 21, 2014. 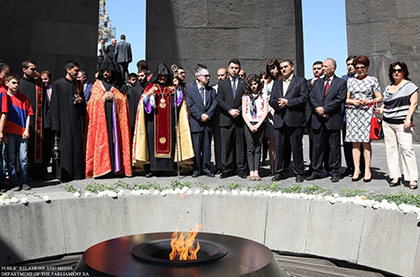 Irakli Garibashvili laid a wreath at the memorial of the Armenian Genocide victims. The Georgian delegation put flowers at the Eternal Fire and honored the memory of the innocent victims with a minute of silence. 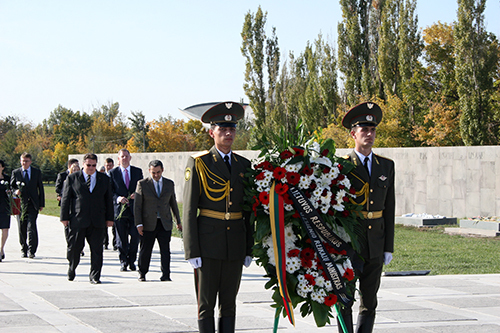 Head of the Department of the Unified State Register of Legal Entities and Individual Entrepreneurs of the MД±nД±stry of Justice of the Republic of Belarus Dmitry Kovalenko and the accompanying delegation visited Tsitsernakaberd Memorial Complex on 11 August 2014. 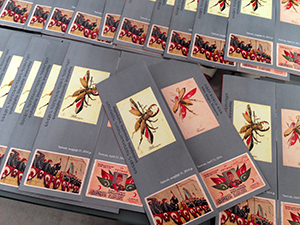 On July 29, 2014 five stamps have been put into circulation within the framework of the 100th anniversary activities of the Armenian Genocide.The preparation of these stamps was contributed by the Armenian Genocide Museum-Institute by providing unique photographs . 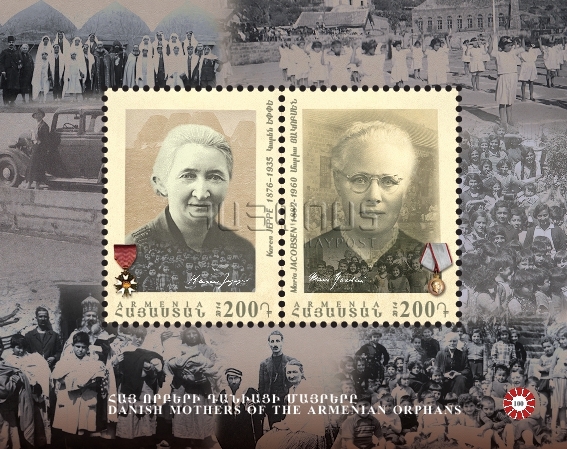 One of the stamps is dedicated to Danish missionaries and great humanists Karen Jeppe and Maria Jacobsen. 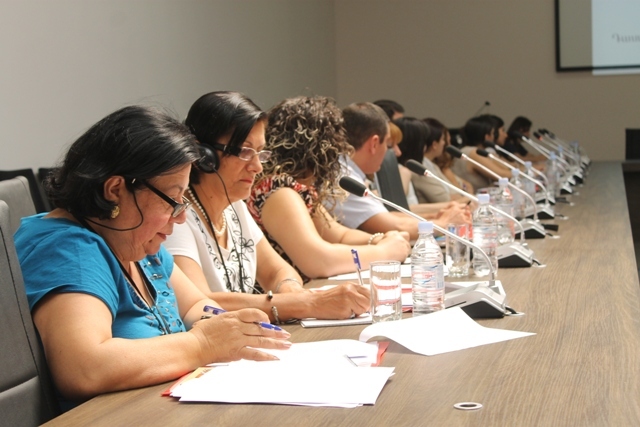 A two-day summer school for teachers organized by вЂњProspectus regional and political research centerвЂќ NGO and AGMI took place on 11 and 12 July at the Armenian Genocide Museum-Institute. The course вЂњHow to Teach the Topic of the Armenian GenocideвЂќ was attended by the teachers of history from Armenia, Artsakh and Diaspora. During the seminars the deputy director of AGMI Doctor Suren Manukyan, a leading researcher at the Institute of Archeology and Ethnography of the National Academy of Sciences of the Republic of Armenia Doctor Harutyun Marutyan, a researcher at the University of California PhD in Armenian language and literature Rubina Pirumyan, an expert at National Institute of Education Tehmina Kocharyan delivered lectures. 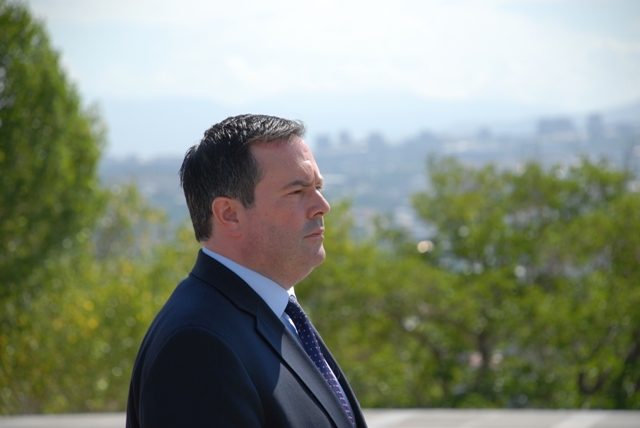 The delegation headed by the Canadian Minister of Employment and Social Development and Minister for Multiculturalism, member of the House of Commons Jason Kenney visited Tsitsernakaberd Memorial Complex on July 30, 2014. Jason Kenney laid a wreath at the memorial of the Armenian Genocide victims. The Canadian delegation put flowers at the Eternal Fire and honored the memory of the innocent victims with a minute of silence. The 11th annual conference of the International Association of Genocide Scholars which was titled вЂњTime, Movement and Space. 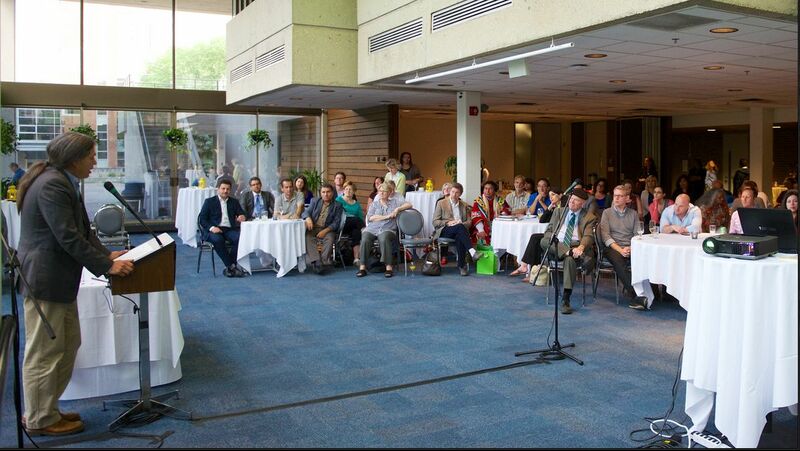 Genocide Studies and Indigenous PeoplesвЂќ took place July 16-19, 2014 in the Canadian city of Winnipeg. The deputy director of AGMI Doctor Suren Manukyan also participated in this conference. His report was titled ("Newcomers and Indigenous: Homogenization of Armenian Homeland as Nation and State Building Project in the Late Ottoman Empire". 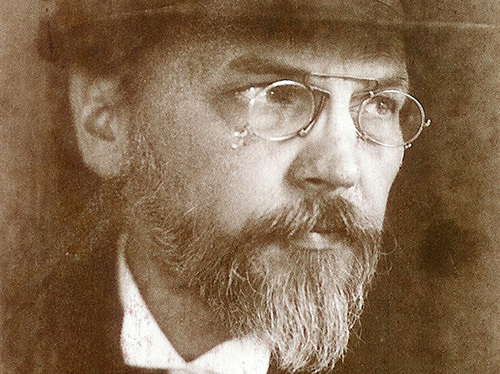 In summer 1914 the вЂњGermanвЂ“Armenian SocietyвЂќ NGO was created by German public figure, orientalist and a great Armenophil, Doctor of Theology Johannes Lepsius. Dealing with the Armenian issue for many years Johannes Lepsius collected means to establish orphanages, schools, hospitals and industrial enterprises for the Armenian population in Asia Minor and the Armenian refugees in different countries. The activity of the вЂњGerman-Armenian SocietyвЂќ is connected with the name of Johannes Lepsius, who was the chairman of this association until he passed away. 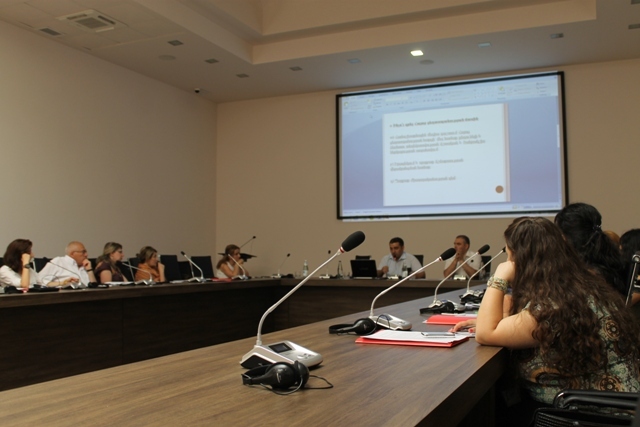 A two-day summer school for journalists organized by вЂњProspectus regional and political research centerвЂќ NGO and AGMI took place on 11 and 12 July at the Armenian Genocide Museum-Institute. 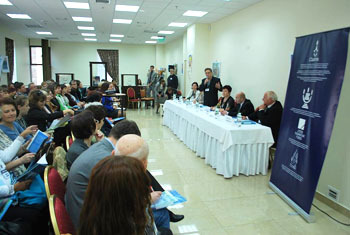 Journalists from the Republic of Armenia and Diaspora took part at the seminar вЂњHow to Cover Armenian Genocide IssuesвЂќ. 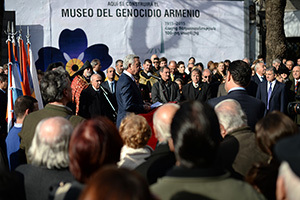 On July 8, within the scope of his official visit to the Republic of Argentina, President Serzh Sargsyan accompanied by the Chief of Staff to the Buenos Aires city government Horacio Larreta, the representatives of local self-government bodies and the Armenian community of Argentina attended the groundbreaking ceremony of an Armenian Genocide museum at the neighborhood of Palermo district in Buenos Aires. After the consecration of the memorial foundation, the Chief of Staff to the Buenos Aires city government Horacio Larreta and the Chief of Armenian PresidentвЂ™s staff Vigen Sargsyan opened it. The special program of the first вЂњFrescoвЂќ international festival of religious films and modern art dedicated to the 100th Anniversary of the Armenian Genocide entitled вЂњThe Monument of TruthвЂќ launched at the Armenian Genocide Museum-Institute. A welcome speech was delivered by AGMI director Hayk Demoyan, where he presented the Hollywood film вЂњAuction of SoulsвЂќ, which is the first movie about the Armenian genocide. RF Minister of Foreign Affairs Sergey Lavrov accompanied by RA Minister of Foreign Affairs Edward Nalbandyan visited Tsitsernakaberd Memorial Complex within the framework of his state visit to Armenia, 22-23 June. RF Minister laid a wreath at the memorial of the Armenian Genocide victims then members of the delegation laid flowers at the eternal fire and honored the memory of the innocent victims with a minute of silence. Today the participants of the 6th conference of the Members of the Brotherhood of the Mother See of Holy Etchmiadzin visited Tsitsernakaberd Memorial Complex. 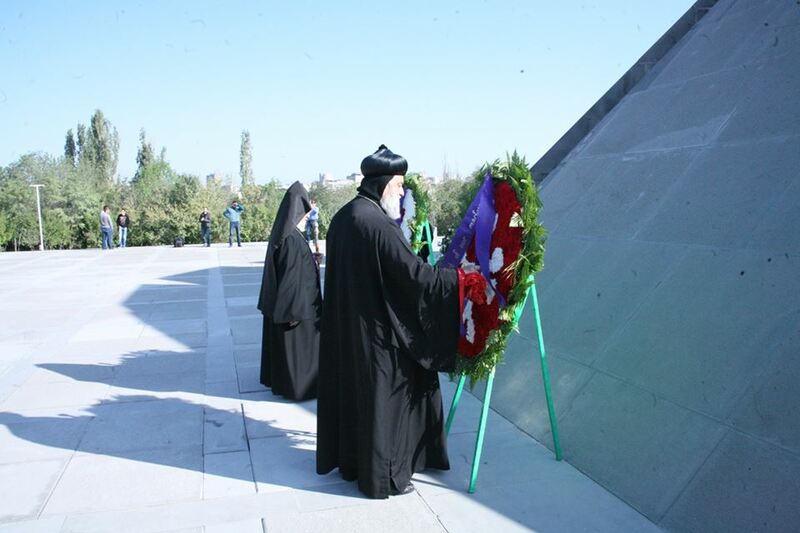 Priests from the dioceses and organizations of the Holy Armenian Apostolic Church laid a wreath at the memorial of the Armenian Genocide victims and served a liturgy in the memory of the Genocide victims of the Genocide at the Eternal Fire. The Israeli delegation put flowers at the Eternal Fire and honored the memory of the innocent victims with a minute of silence. 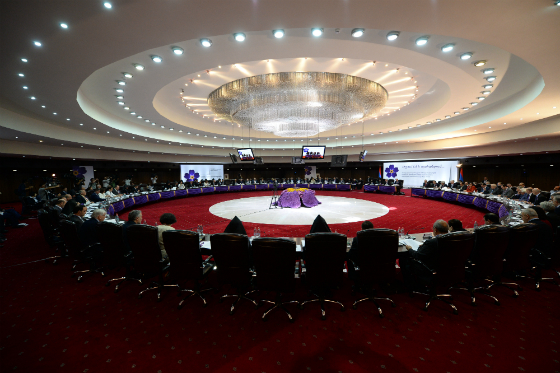 On 13 June 2014, RA Parliamentary hearings titled вЂњPromoting the process of international recognition and condemnation of the Armenian Genocide and the scheduled works dedicated to 100th Anniversary of Armenian Genocide and the parliamentary participation opportunitiesвЂќ were held in the conference hall of AGMI. The delegation of the World Council of Churches headed by Rev. Dr. Olav Fykse Tveit, the General Secretary of the World Council of Churches visited Tsitsernakaberd Memorial Complex. 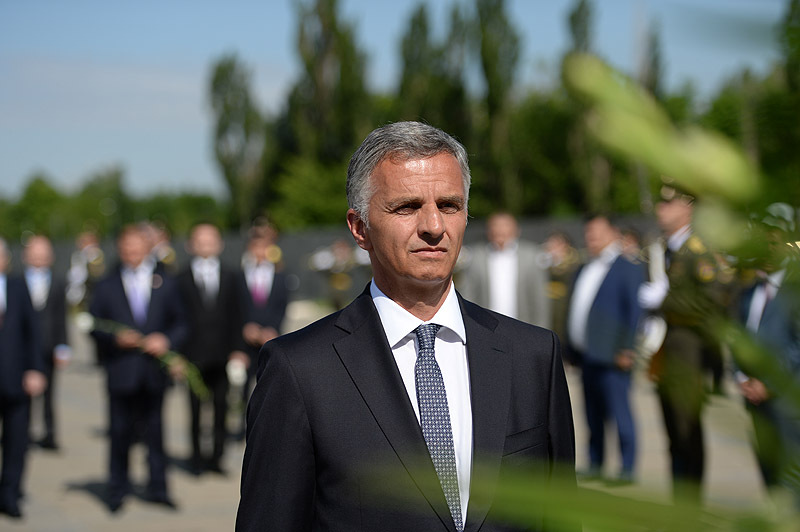 The OSCE Chairperson-in-Office, Swiss Foreign Minister and President of the Confederation Didier Burkhalter and the accompanying delegation visited Tsitsernakaberd Memorial Complex within the framework of his state visit to Armenia. Staff members of the Russian Embassy in Yerevan visited the temporary exposition вЂњThe First World War: Allies, Images and MassacresвЂќ at Armenian Genocide Museum Institute. AGMI director Hayk Demoyan introduced to the guests the history of unique items that are stored in the Museum. 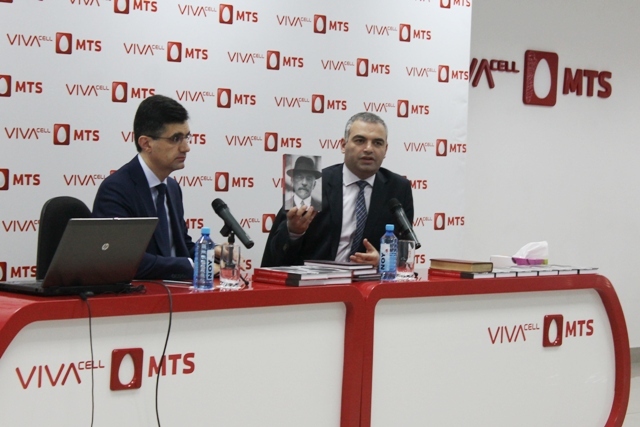 On 30 May the director of the Armenian Genocide Museum-Institute Hayk Demoyan met the employees of VivaCell-MTS and presented a lecture titled вЂњThe Armenian Genocide in the Eyes of Foreign WritersвЂќ. 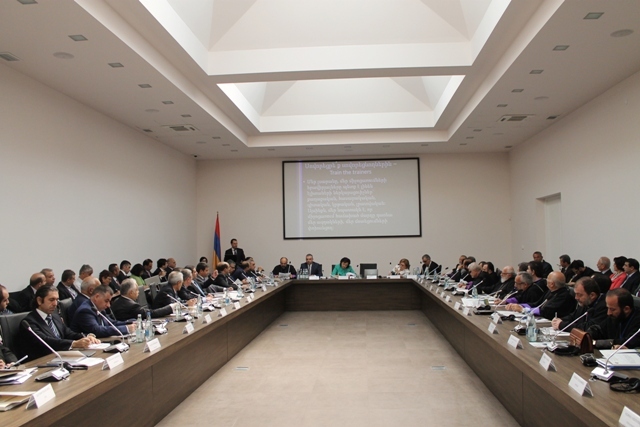 Рўhe fourth meeting of State Commission on Coordination of the events dedicated to the 100th Anniversary of the Armenian Genocide took place at the Sport and Concert complex in Tsitsernakaberd, which was chaired by RA president Serzh Sargsyan. On May 22 the assembly-meeting of the Regional Committees coordinating the events dedicated to the 100th anniversary of the Armenian Genocide took place at the conference hall of the Armenian Genocide Museum-Institute by the initiative of RA Ministry of Diaspora. The Armenian Genocide Museum-Institute has acquired a unique and a rich collection of photos related to the Armenian Genocide and its aftermath. Highlighting the importance of memory preservation and transmission to future generations, the heirs of Khanikyan family from Greece donated around 450 original photos to the Armenian Genocide Museum-Institute. 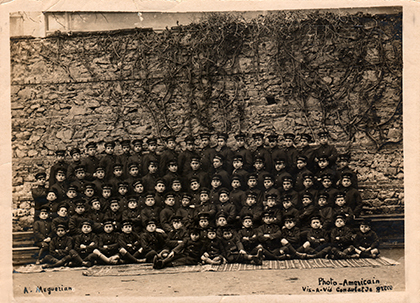 The collection contains original photos related to orphansвЂ™ life, the orphanages of the Ottoman Empire, Egypt, Greece and Syria, orphan care activities of вЂњAmerican Near East ReliefвЂќ organization, as well as photographs related to the special episodes of the history of the Armenian Genocide. Russian edition of the American Forbes magazine has included the Armenian Genocide Museum in the list of 9 memorial museums to be visited by everyone. The list is dedicated to the opening 9/11 Memorial Museum on 21 May, in New York, in the memory of the victims of terrorist attack on 11 September, 2001. 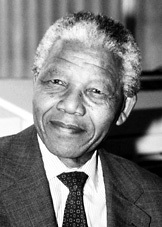 The вЂњMust-SeeвЂќ list also includes the Holocaust Museum in Jerusalem (Yad Vashem), Hiroshima Peace Memorial Museum (Japan), Gulag History Museum in Moscow, the Chernobyl Museum in Kiev, the Apartheid Museum in Johannesburg, which is dedicated to the policy of racial discrimination in the country in 1948-1994, etc. The center for regional and political studies вЂњProspectusвЂќ NGO, the Armenian Genocide Museum-Institute and the Youth Foundation of Armenia as a partner organization of RA president, are organizing a two-day summer school for Armenian history teachers on July 30 and 31, 2014. High school history teachers from RA, NKR and Diaspora are welcome to participate in the program. Participating teachers will receive the relevant literature to read before the start of the program and at the end of the program certificates of participation will be given. Knowledge acquired during the summer school will be implemented in the teaching process. The center for regional and political studies вЂњProspectusвЂќ NGO, the Armenian Genocide Museum-Institute and the Youth Foundation of Armenia as a partner organization of RA president, are organizing a two-day summer school for journalists on July 29 and 30, 2014. Journalists from RA, NKR and Diaspora, with at least two years of work experience are welcome to participate in the program. 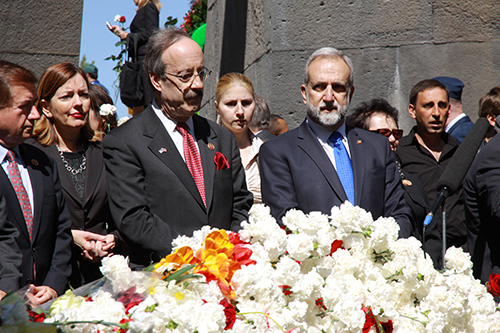 The Deputy Speaker of the National Assembly of the Republic of Armenia, Parliamentary Faction members, the Ambassador Extraordinary and Plenipotentiary of Greece to the Republic of Armenia Ioannis Tais, and the representatives of the Greek community of Armenia on May 19, at the Remembrance Day of the Pontian Greeks Genocide. Members of the delegation laid wreaths and flowers at the Armenian Genocide memorial and observed a minute of silence in the memory of the innocent victims. On the 17th of May, the Armenian Genocide Museum-Institute joins the pan-European event вЂњMuseum NightвЂќ. The exhibition will be open from 11am to 9 pm. The temporary exhibition вЂњThe First World War: Allies, Images and MassacresвЂќ was opened in the newly built exhibition hall of the Armenian Genocide Museum-Institute on the occasion of centennial of the World War I, on the 21st of April, 2014. On the 14th of May an event dedicated to the Genocide of the Greeks was held at the Hellenic War Museum in Athens. During the evening Extraordinary and Plenipotentiary Ambassador of RA to Greece Gagik Ghalachyan delivered a welcome speech, after which the Director of the Armenian Genocide Museum-Institute and the Secretary of the State Commission on the Commemoration of the 100th Anniversary of the Armenian Genocide Hayk Demoyan delivered a public lecture titled вЂњThe Odyssey of Aurora MardiganianвЂќ. The evening was organized by the Armenian Embassy in Greece, the Regional Board of Ramkavar-Azatakan party (Armenian Democratic Liberal party) and ARF (Armenian Revolutionary Federation) Central Committee. 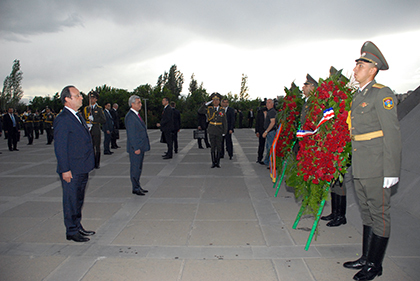 The delegation headed by the President of France Francois Hollande who is on an official visit to Armenia and President of Armenia Serzh Sargsyan visited Tsitsernakaberd Memorial Complex on May 12, 2014. 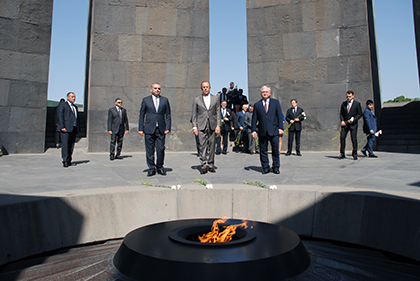 The presidents of Armenia and France laid wreaths at the Genocide Memorial. Francois Hollande and the accompanying delegation laid flowers at the eternal fire and observed a minute of silence in the memory of the innocent victims. 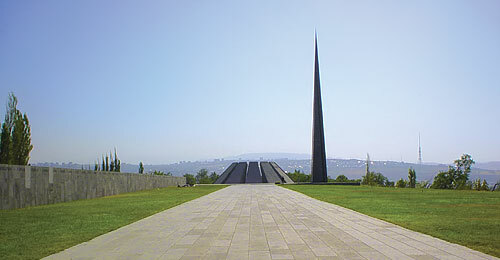 The delegation headed by the Head of Military Police Department of Georgian Armed Forces Colonel Kakhaber Chikhradze visited Tsitsernakaberd Memorial Complex. 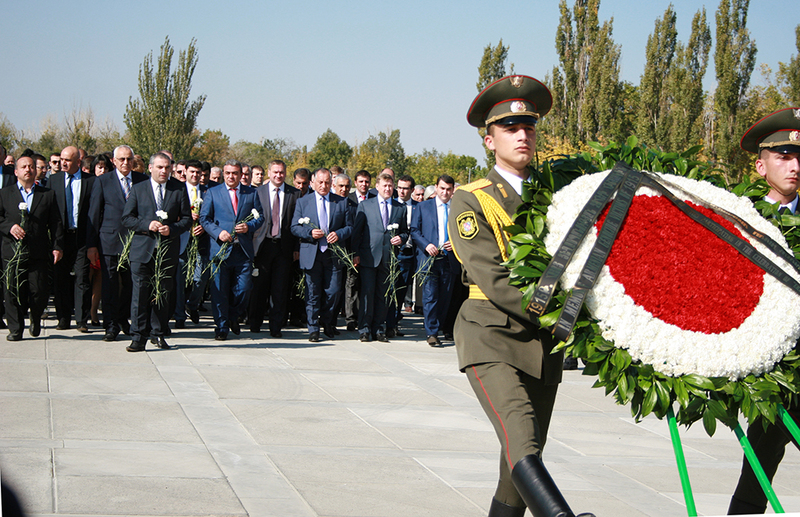 Colonel Chikhradze and members of the delegation laid flowers at the eternal fire and and honored the memory of the innocent victims with a minute of silence. 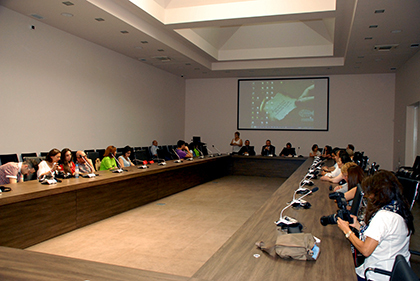 Awarding ceremony of the winners of the International ChildrenвЂ™s Exhibition of Fine Arts Lidice was held at the temporary exhibitions hall of Armenian Genocide Museum-Institute. Director of AGMI Hayk Demoyan, welcomed the participants and noted that children were the guests of the new exhibition hall for the first time. "There will operate a special room for the pupils in the new museum building, where classes on the history of the Armenian Genocide will be held", - said Hayk Demoyan. According to the ChargГ© d' Affaires of the Embassy of the Czech Republic in Armenia Peter Mikiska, 34 schools from all over Armenia participated in the competition and one third of them have received various awards, including the grand prize - the medal "Rose of Lidice ". Mitropolit of Helsinki Ambrosios and those accompanying him, including Doctor of Law Anti Haykinhaymo and Deputy Head of the Union of the Finnish Municipality Timo Kiteveyne visited Tsitsernakaberd Memorial Complex at 29 April, 2014. Mitropolit of Helsinki laid a wreath at the Genocide Memorial,members of the delegation laid flowers at the eternal fire and and honored the memory of the innocent victims with a minute of silence. 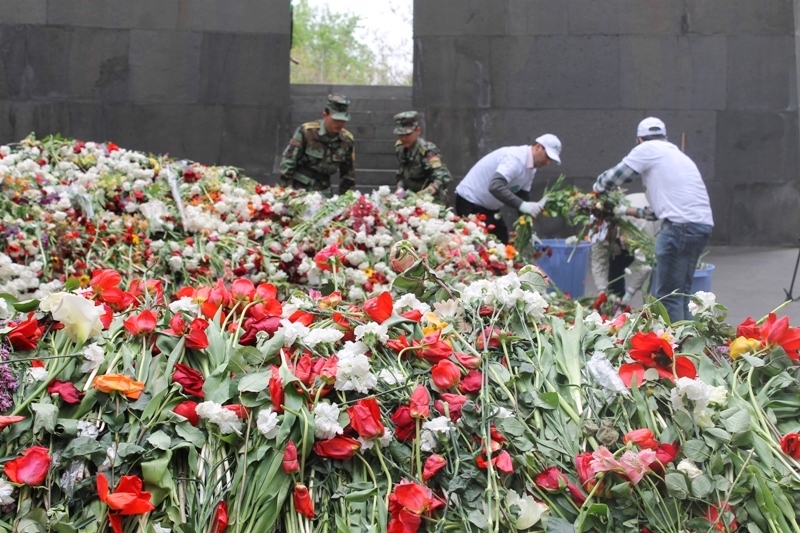 The Foundation for the Preservation of Wildlife and Cultural Assets in cooperation with the Armenian Genocide Museum-Institute and "VivaCell-MTS" telecom operator carried out the recycling process of the gathered flowers on April 26 at Tsitsernakaberd Memorial. Within the frames of this activity, which is holding for the fifth time, all the flowers are carefully collected and transported to the back of the monument, their stems and petals are separated. President of Republic of Armenia Serzh Sargsyan, Catholicos of all Armenians His Holiness Garegin II and Prime Minister Hovik Abrahamyan accompanied by the members of parliament and government visited Tsitsernakaberd. They honored the memory of innocent victims, after which His Holiness Karekin II, Catholicos of All Armenians prayed for the repose of the victimsвЂ™ souls. Today is the Rememberance Day of the Armenian Genocide _ the 99th anniversary of the Armenian Genocide. 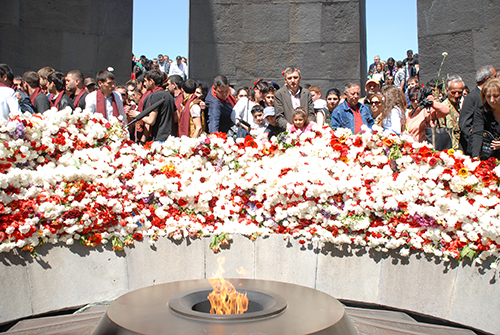 Every year on April 24th hundreds of thousands of Armenians from Armenia and Diaspora as well as a lot of foreigners visit the Tsitsernakaberd Memorial Complex to put flowers at the eternal fire and to pay tribute to the memory of the innocent victims of the Armenian Genocide. 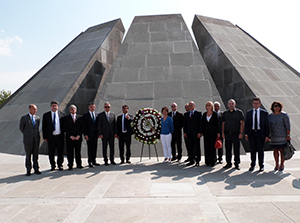 The Chairperson of the United States House Committee on Foreign Affairs Ed Royce, senior member Elliot Engel, David Cicilline and Lois Frankel visited Tsitsernakaberd Memorial Complex to commemorate 99 anniversary of the Armenian Genocide. US congressmen put flowers at the Eternal Fire and honoured the memory of the innocent victims with a minute of silence. I am taken by surprise that after 99 years of the Genocide that the Ottoman government committed in the course of WWI against Armenians and other Christians in the Ottoman Empire, the Turkish leader of today simply expresses regret about the вЂ�events of 1915вЂ™ on the eve of April 24 вЂ“ the Genocide Memorial Day. I have to confess that this is an important step, but regretfully not in a direction of revealing the truth, facing the history and enabling reconciliation between Armenian and Turkish peoples. 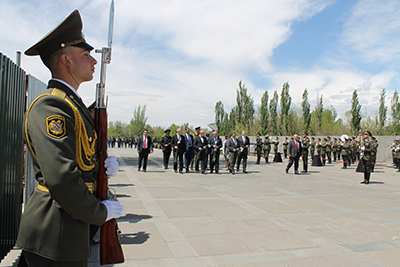 The delegation headed by the Minister of National Defence of the Republic of Lithuania Juozas Olekas visited Tsitsernakaberd Memorial Complex at 23 April, 2014. The Minister of National Defence laid a wreath at the Genocide Memorial,members of the delegation laid flowers at the eternal fire and and honored the memory of the innocent victims with a minute of silence. вЂњThe Caucasus Frontline of the First World War: Genocide, Refugees and Humanitarian AidвЂќ international conference started its second day, at the conference hall of the Armenian Genocide Museum-Institute. 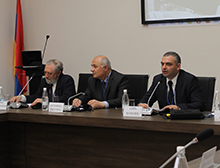 AGMI researchers Ph.D. in history Gevorg Vardanyan, Gohar Khanumyan, Lusine Abrahamyan, Robert Tatoyan, as well as researcher of Armenian National Academy of Science Ph.D. in history Knarik Avagyan, and researcher of the Sardarapat museum Khoren Grigoryan, participated in the conference with their reports. The international conference вЂњThe Caucasus Frontline of the First World War: Genocide, Refugees and Humanitarian AidвЂќ started at 21 April at Armenian Genocide Museum. Leading specialists from Armenia, Russia, Italy, Canada, France, Poland and the United States will take part in the conference. During the two-day conference speakers will refer to the recruitment of the Armenians in the Ottoman Empire during World War I, their disarmament, the Armenian Genocide perpetrated by the Young Turk government, the Pan-Turkish network operations, the activities of foreign journalists, the Armenian battles of self-defense, the diplomatic role of warring countries, testimonies, Armenian voluntary movement, Armenian refugees and issues related to survivors. On the occasion of centennial of World War I, the Armenian Genocide Museum-Institute has opened a temporary exhibition вЂњThe First World War: Allies, Images and MassacresвЂќ. The exhibition demonstrates hundreds of newly found original caricatures, postcards and posters that represent a unique iconography condemning Turkey as a country that perpetrated genocide. The annual press conference of the Director of the Armenian Genocide Museum-Institute, the Secretary of the State Commission on Coordination of the events dedicated to the 100th Anniversary of the Armenian Genocide Hayk Demoyan held at Armenian Genocide Museum-Institute. 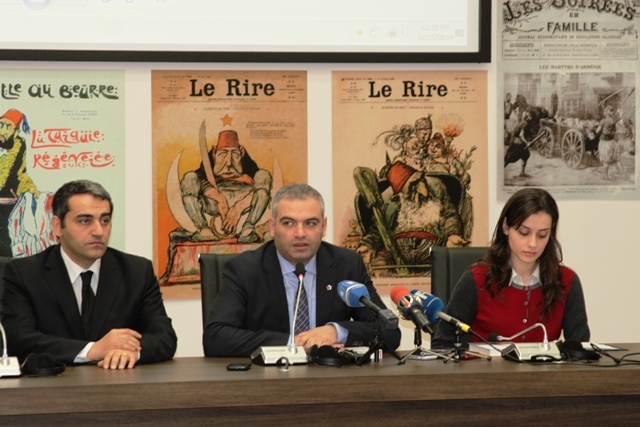 During the press conference Hayk Demoyan presented last yearвЂ™s activities of the Museum-Institute and addressed to the results and achievements. 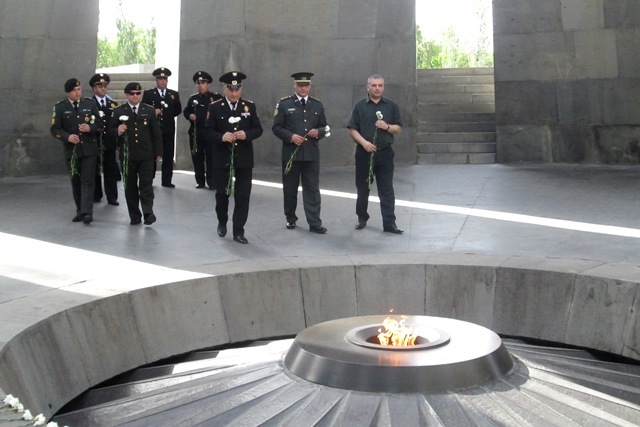 Commanders of the Frontier Troop Headquarters of CIS Member States visited Tsitsernakaberd Memorial Complex. Suren Manukyan, the Deputy Director of Armenian Genocide Museum-Institute presented to the Commanders of the Frontier Troop Headquarters of Armenia, Belarus, Kazakhstan, Kyrgyzstan, Russia, Tajikistan and Turkmenistan the general history of the Armenian Genocide. 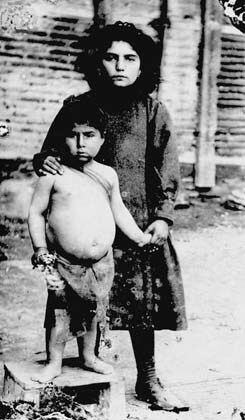 As a result of the Armenian Genocide about 500 000 Armenian children were killed during 1915-1923 (they were burned, poisoned, strangled), some of them died of starvation and various epidemic diseases. The children, who survived the Genocide were left orphaned and were forced to convert to Islam. 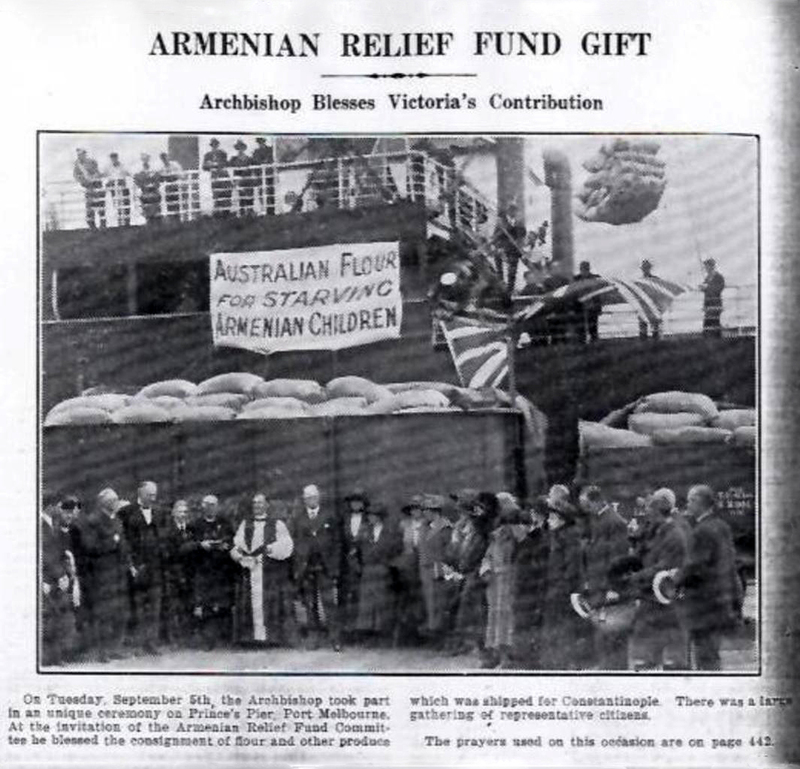 The Armenian associations, church organizations, foreign relief organizations (American Near East Relief Committee, The Lord MayorвЂ™s Fund of London, Danish Women's Union, The Russian Red Cross, Union of Russian Cities, etc. 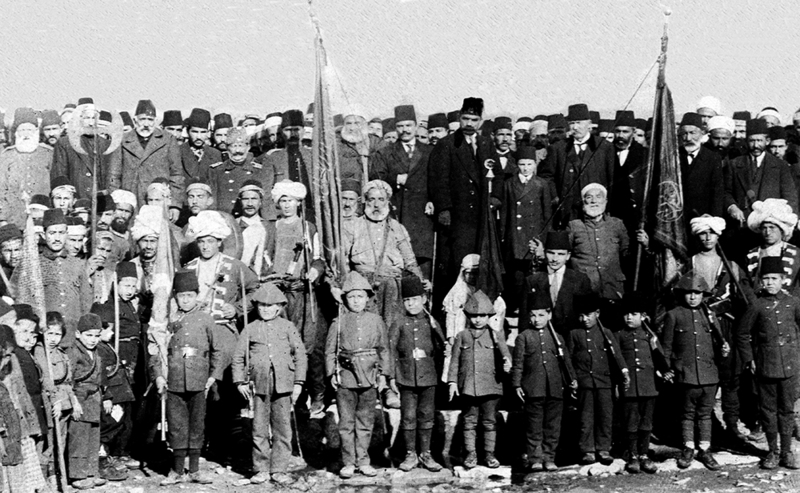 ), as well as international organizations (Red Cross, The League of Nations) were involved in saving the survived Armenian children from impending death and bringing them out of the Ottoman borders. 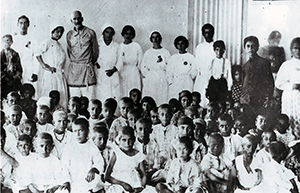 Taking the children, who were on the verge of death, out of the Ottoman Empire would insure their physical security and solve the problem of residency and national education. 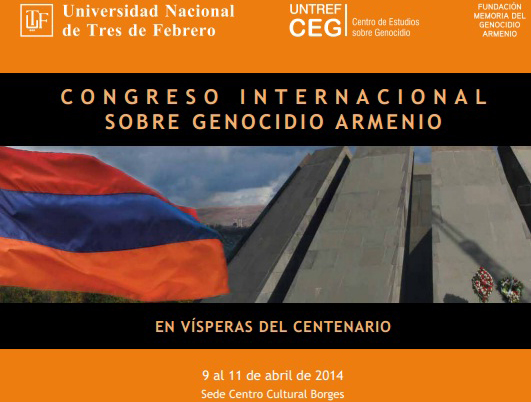 On 9-11 April, under the auspices of the Armenian Embassy in Buenos Aires an international conference вЂњOn the Eve of the Centennial of Armenian GenocideвЂќ was held in Borges cultural centre, Buenos Aires. The conference was organized by the Genocide Studies Center of the State University of Buenos Aires and Genocide Memorial Fund of Buenos Aires. Academic representatives and institute researchers from Argentina, Armenia, USA, Mexico, Brazil, France, Switzerland and Turkey took part in the conference. ARLINGTON, Mass. 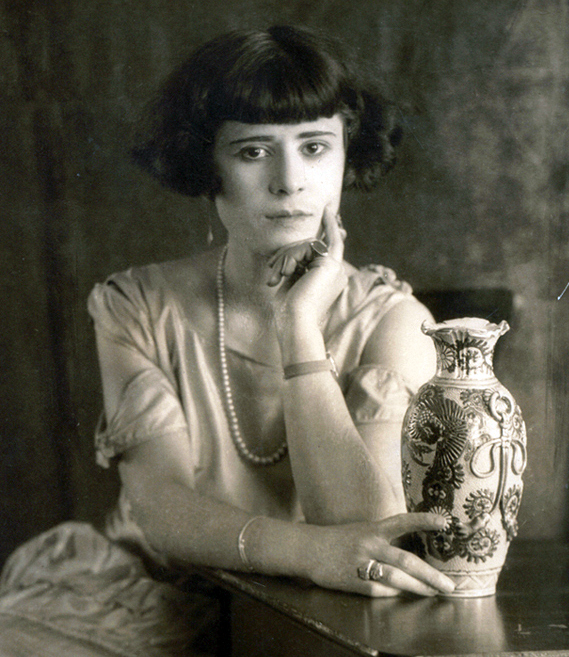 вЂ” In the 1920s, the name and face of Aurora Mardiganian were well known in the United States and beyond. 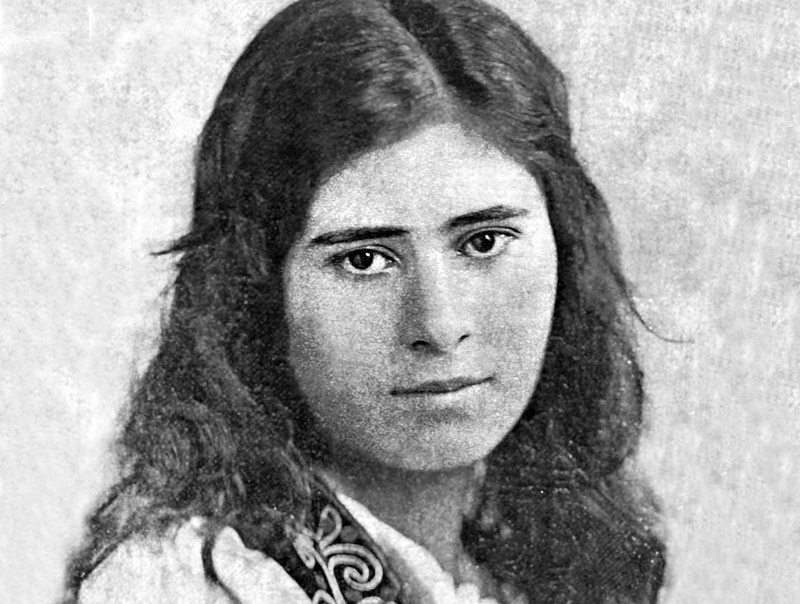 Her autobiography, Ravished Armenia; the Story of Aurora Mardiganian, was a bestseller and the movie based on it, вЂњAn Auction of Souls,вЂќ was a hit too. However, in the ensuing decades, she was forgotten, becoming another one of the anonymous casualties of the Armenian Genocide. 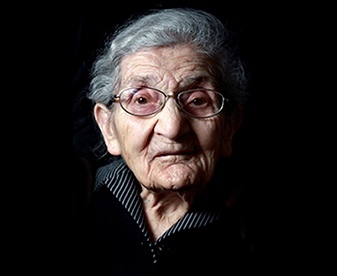 She is now being reclaimed by the Armenians in an effort led by Dr. Hayk Demoyan, director of the Armenian Genocide Museum-Institute in Yerevan. Demoyan presented an illustrated lecture about Mardiganian on March 8 at the Armenian Cultural Foundation, at a program co-sponsored by the foundation, the Armenian International WomenвЂ™s Association and the National Association for Armenian Studies and Research. The delegation headed by the Deputy Chief of Air Force Air Defence, Chief of Staff of Aerospace Defense Forces of the Russian Armed Forces, the First Deputy Commander of Aerospace Defence Forces Lieutenant-General Pavel Kurachenko, secretary of the council of the CIS defence ministers Lieutenant General Alexander Sinaisky and Chief of the CSTO Joint Staff Lieutenant General Alexander Studenikin on April 9, 2014 visited Tsitsernakaberd Memorial Complex. The International conference вЂњHonoring Those Who Helped Rescue a Generation of Armenian Survivors (1915-1930)вЂќ was held at the Ararat-Eskijian Museum in Mission Hills, Los-Angeles on March 22, 2014. On the occasion of the one-hundredth anniversary of World War I, the event gave a tribute to all the countries and individuals that had sacrificed much to aid a perishing nation. The Armenian populated area of Kesab (with its center of the rural town of Kesab) is located in the north-west of Syria, in Aleppo province, near Alexsandretta, Antioch and Latakia and 3 km far from the Mediterranean Sea. The presence of the Armenians in Cilicia and in coastal regions of Assyria is evidenced by the times of Tigran the Great. 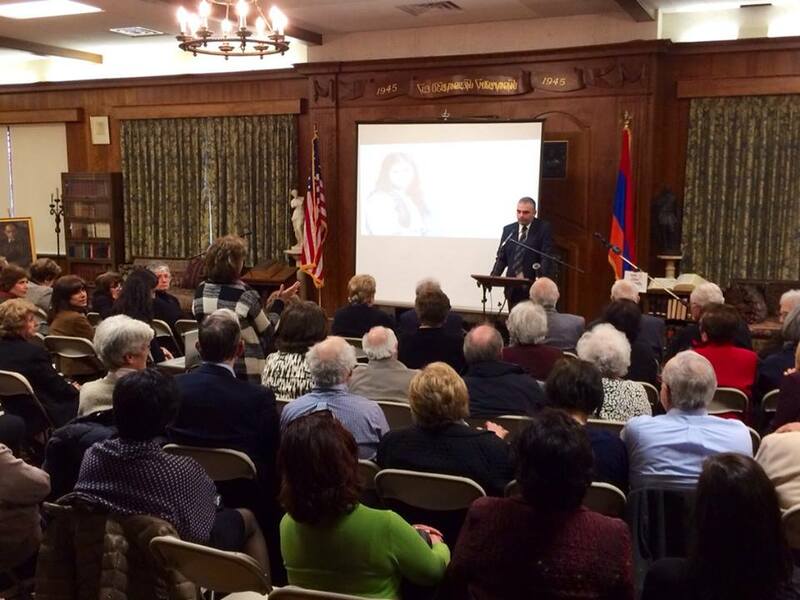 The lecture of AGMI director Dr Hayk Demoyan, dedicated to Aurora Mardiganian was hold in Boston on March 8. The event was organized in commemoration of WomenвЂ™s History Month and International WomenвЂ™s Day. It was hosted by the Armenian Cultural Foundation and co-sponsored by the National Association for Armenian Research (NAASR) and Armenian International WomenвЂ™s Association (AIWAI). 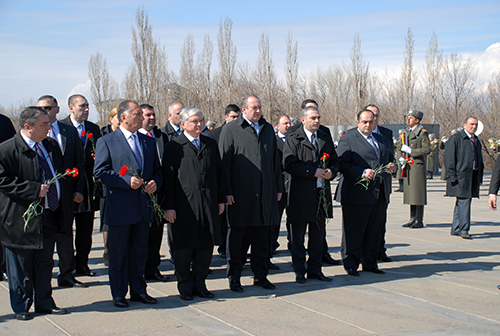 A delegation headed by Minister of Foreign Affairs of Serbia Ivan MrkiД‡, on March 10, 2014 visited the Tsitsernakaberd Memorial Complex. Mr. Ivan MrkiД‡ laid a wreath at the monument. The members of the delegation put flowers at the Eternal Fire and honored the memory of the innocent victims with a minute of silence. On 4th March a meeting was held between Secretary of the State Commission on the Commemoration of the 100th Anniversary of the Armenian Genocide, Director of Armenian Genocide Museum-Institute Hayk Demoyan and Jacques Fredj Director of the Shoah Memorial in Paris. During the meeting Demoyan and Fredj discussed the ways of cooperation between the two institutions in fields of joint researches, developing educational programs development and information exchanging. 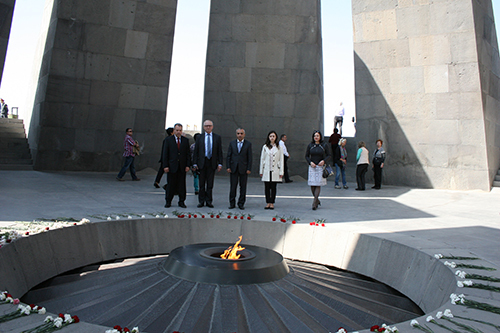 Participants of the First Pan-Armenian Winter Games visited the Armenian Genocide Memorial on February 28. 2014. 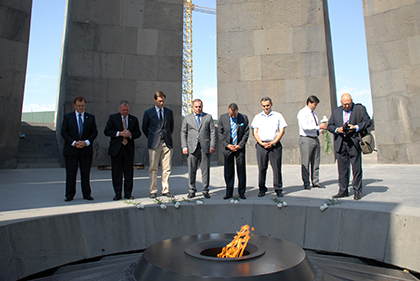 The sportsmen's delegation from different countries laid a wreathes at the memorial of the Armenian Genocide victims. The visitors laid flowers at the eternal fire of the Genocide victims with a minute of silence in remembrance of the innocent victims. 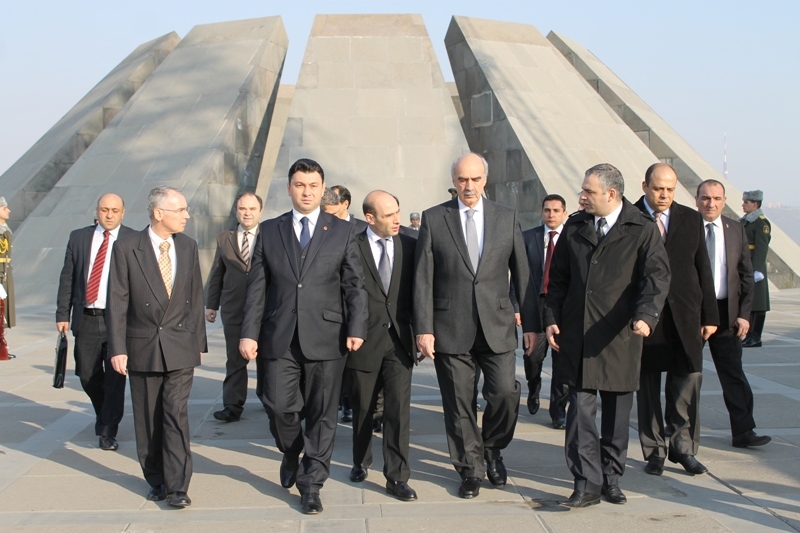 The President of Georgia Giorgi Margvelashvili, who arrived to Yerevan with an official visit, accompanied by the high-ranking officials of RA and Georgia, visited Tsitsernakaberd Memorial Complex. The Georgian delegation paid a tribute of respect to the victims of the Armenian genocide and put flowers at the memorial of the Armenian genocide. 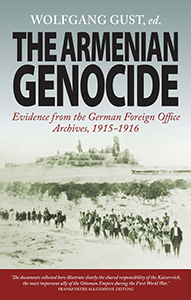 The Zoryan Institute (Toronto), has published the English edition of вЂњThe Armenian Genocide: Evidence from the German Foreign Office Archives, 1915-1916вЂќ. The book includes hundreds of telegrams, letters and reports from German consular officials in the Ottoman Empire to the Foreign Office in Berlin. The documents provide unequivocal evidence of the genocidal intent of the Young Turks and the German governmentвЂ™s official acquiescence complicity. The exceptional importance of these documents is underscored by the fact that only German diplomats and military officials were able to send uncensored reports out of Turkey during World War I. 19th February, 2014 is the 145th birth anniversary of renowned poet, writer, literary, and national public figure Hovhannes Tumanyan. In the years of Armenian Genocide he couldnвЂ™t be indifferent to the fate of his nation. 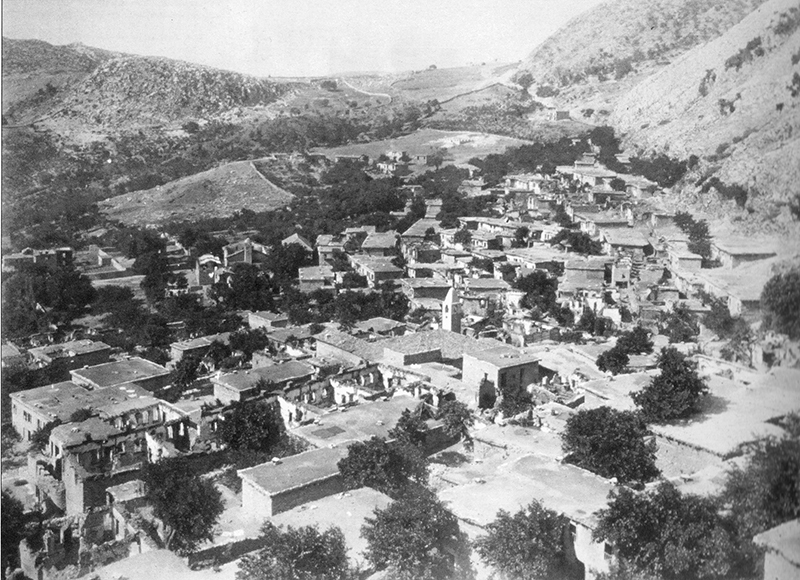 On 1915 he together with his daughter Nvard moved from Tiflis to Echmiadzin, where the Armenian refugees were sheltered, and most of them where homeless orphans. Here, with the direct supervision and control of H. Tumanyan an orphanage was opened, where about 3000 children were sheltered. 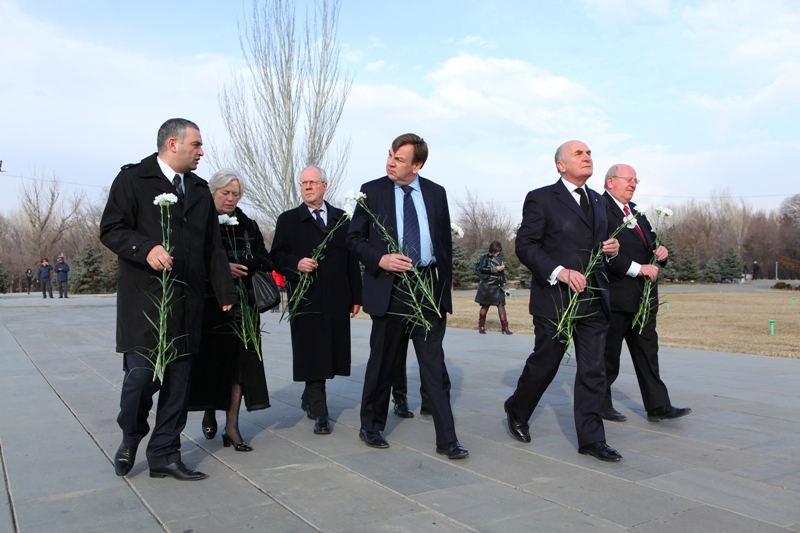 The delegation of the British Group of the Inter-Parliamentary Union visited Tsiternakaberd Memorial at February 18. The members of the delegation put flowers at the Eternal Fire and honored the memory of the innocent victims of the Armenian genocide with a minute of silence. British delegation also visited the Armenian Genocide Museum-Institute and got acquainted with the British press archives from the collection of AGMI, presenting Armenian massacres. While browsing in an antique shop in Oregon last summer, a tiny, glass bottle filled with grains of rice caught my eye. I picked it up and read the label. 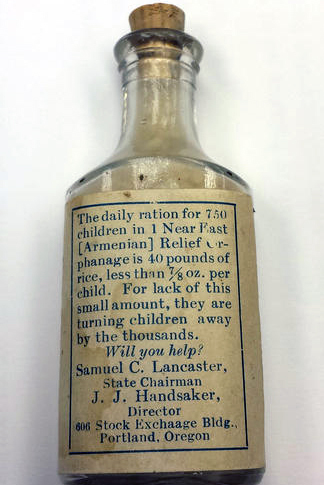 "The daily ration for 750 children in 1 Near East [Armenian] Relief Orphanage is 40 pounds of rice, less than 7/8 ounce per child. For lack of this small amount, they are turning children away by the thousands. Will you help?" Intrigued, I purchased the bottle, brought it home and put it on a shelf; promising myself that I would research this artefact one day. 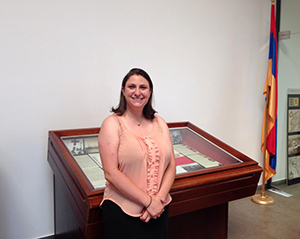 The Armenian Genocide Museum-Institute for the first time presents to the Armenian reader the entire memories of U.S. 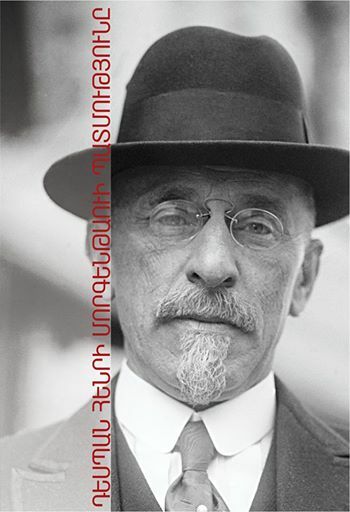 Ambassador to the Ottoman Empire (1913-1916) Henry Morgenthau, in Eastern Armenian edition. 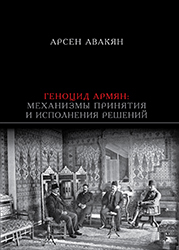 These memoirs have the significant of a unique source for the history of the Armenian Genocide, particularly, to reveal the folds of the crime, which was determined and planned by the Turkish Government, and to identify and explore the mental of the Turkish criminal regime of that time. The memoir of U.S. Ambassador is a monumental work indeed, where the represented facts and testimonies undeniably prove the fact of planned and committed Genocide. The story of life of Arshalouys (Aurora) Mardiganian, girl from Chmshkatsag, who survived the Genocide, is one of many impressive and thrilling stories, through those the whole story of the Armenian Genocide could be told. Witnessing the deaths of her family members brutally murdered in front of her eyes, fourteen years Arshalouys was tortured and ravished by German officers, at harems of Turkish officials and Kurdish tribesmen. Haroutyoun Khachatryan, being military physician during World War II posthumously awarded with вЂњRighteous Among the Nations AwardвЂќ, by the Jewish "Yad Vashem" organization. During the event on 4th February Ambassador Extraordinary and Plenipotentiary of Israel to Armenia Mr. Shmuel Mayrom and Honorary Consul of Israel in Armenia Ashot Shakhmuradyan handed the medal to Haroutyoun KhachatryanвЂ™s granddaughter, Armenian singer Anna Khachatryan. вЂњThe Book of WhispersвЂќ narrates about The Armenian Genocide and the horrors of 20th century. This shocking work received high evaluations from the international media and literary circles for presenting with almost documentary accuracy the horrors of Genocide and stories of Armenian resettlers, trying to survive in foreign lands.